First and foremost: organic and natural beauty continues to be popular in Japan; quite a few domestic brands are now certified by one of the European associations: most often Ecocert and BDIH (like Bior). A trend that is closely associated with the rise of natural products and ingredients is, of course, clean beauty. 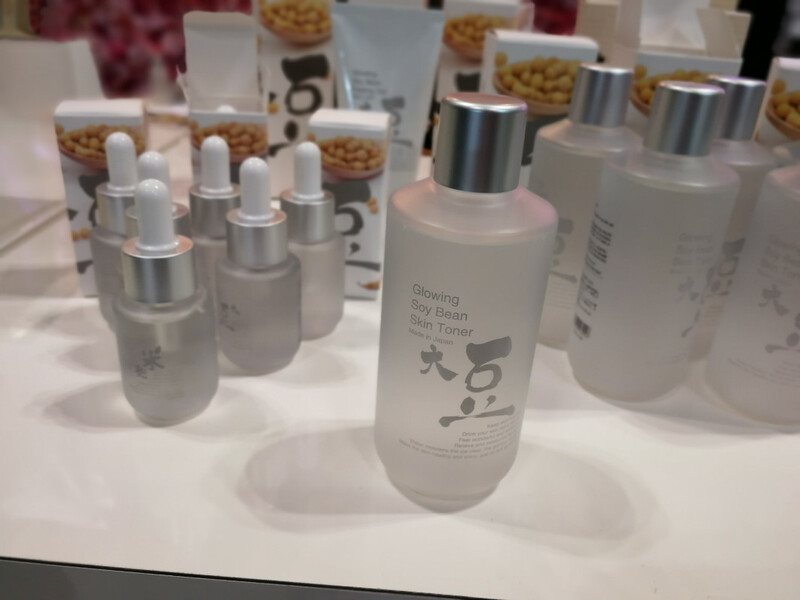 There were a number of clean/green beauty brands at the show (in fact, most of the new brand launches appear to have a clean beauty angle), like Japanese anti-acne care brands NBK and Puri. Or rice bran brand Komenuka which definitely falls into the natural category. More on these brands further down the article! 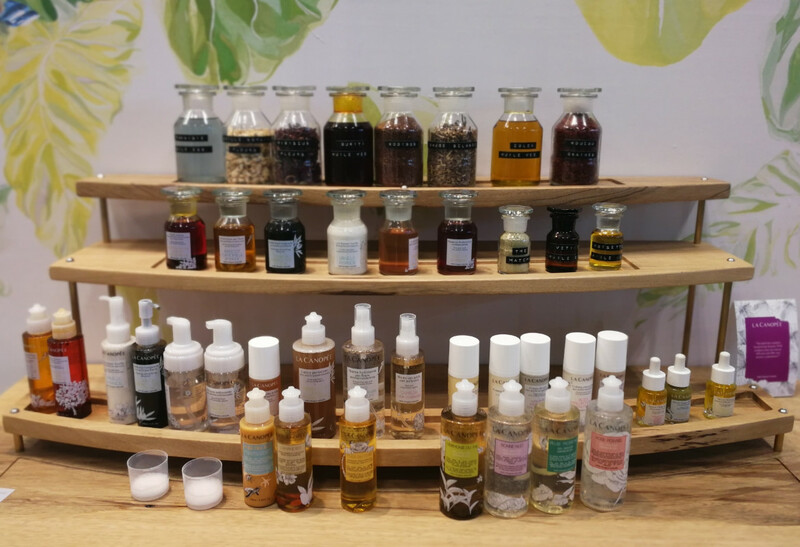 The microbiome/probiotic skin care trend was also visible at Cosme Tokyo. This was the first time that I’ve come across Asian brands launching these kind of products – I must admit that hitherto I associated probiotic beauty primarily with Western brands. Which is obviously not true! 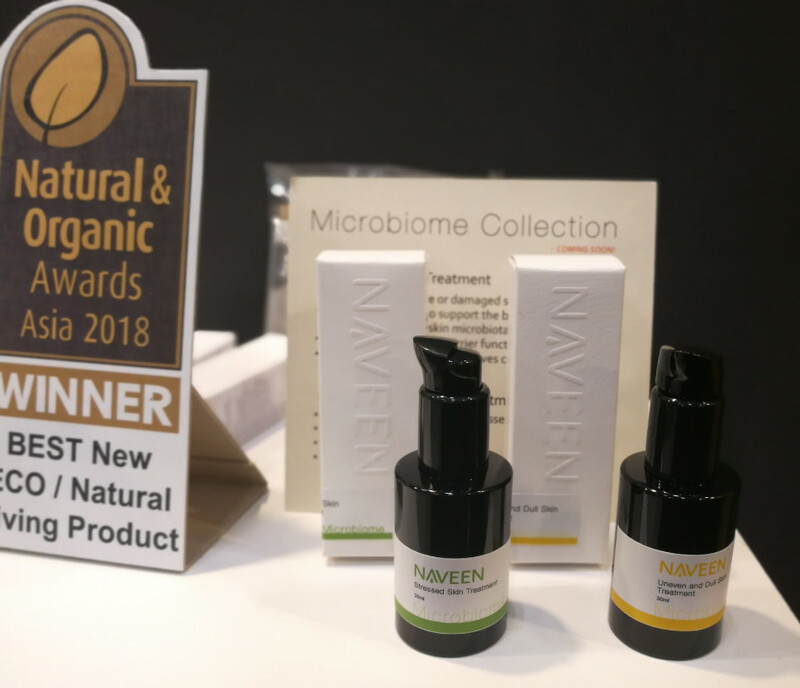 Taiwanese brand Naveen, for example, has just launched two probiotic skin care serums and I saw a new Korean brand which also offers beauty products with ingredients that’ll protect the skin’s natural bacterial flora. 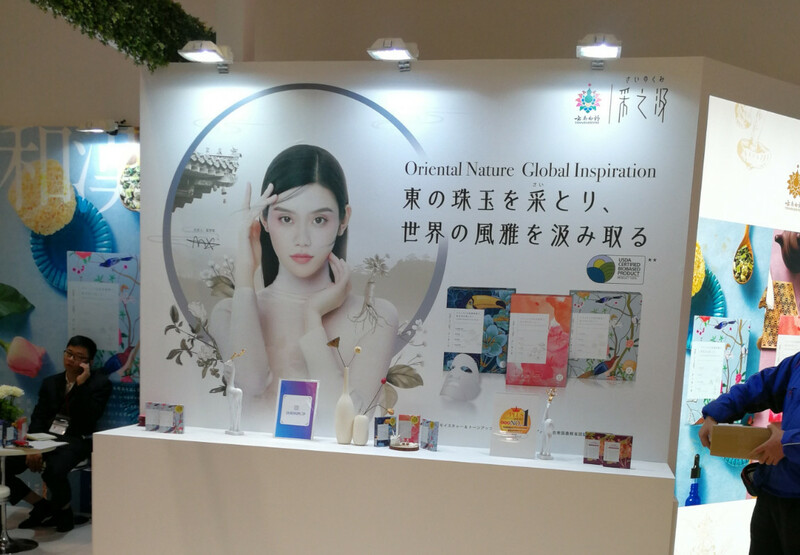 At the same time high-tech skin care was just prominent at the show, with a particular emphasis on human stem cell products. 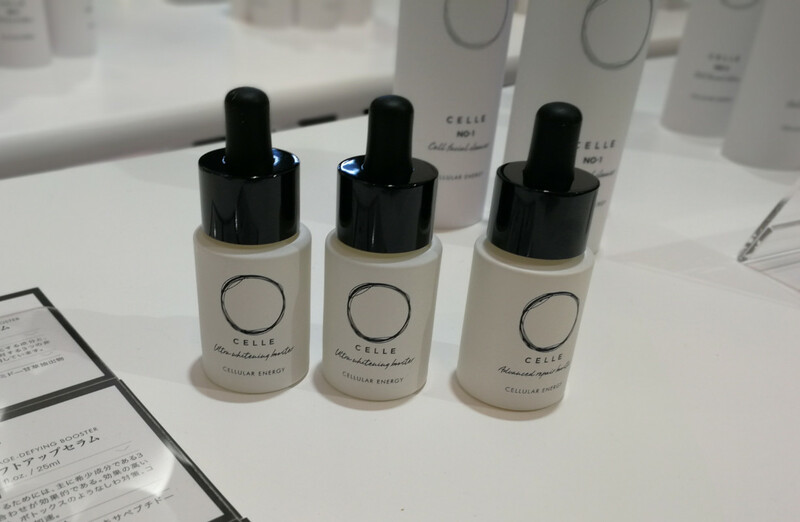 I saw a few of these at last year’s Cosme Tokyo but was told that at this year’s trade fair there were some 50 new skin care launched based on human stem cells as key ingredient. 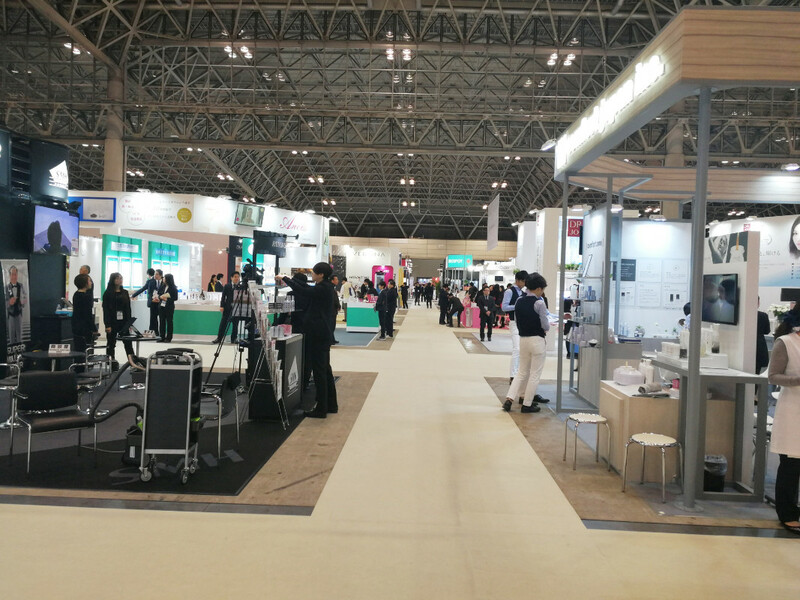 The number of Korean exhibitors almost doubled in 2019 – in fact, there were more international exhibitors in general, divided into actual country pavillions rather than just scattered around the hall. Poland had an especially large country pavillion and I was very pleased to see organic beauty brand Naturativ and its founder Magda again. 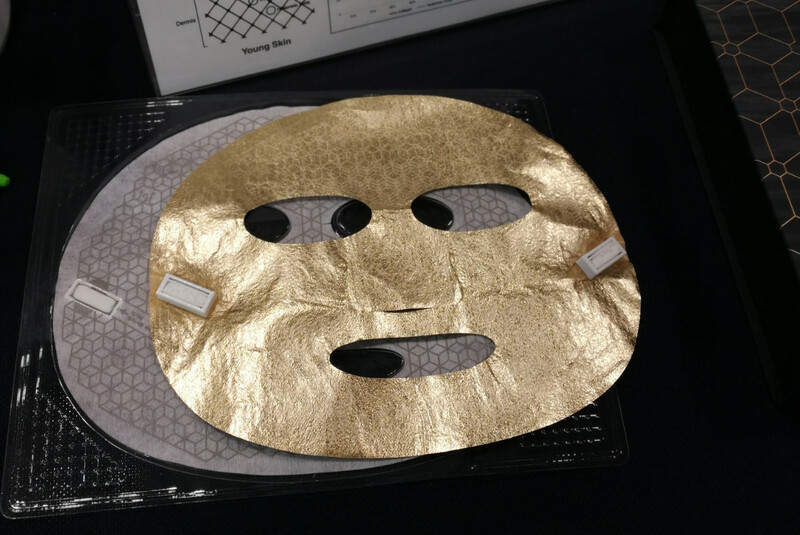 Two of my favourite Korean exhibitors were Franz Skincare with a gorgeous new gold-covered micro-current mask and beauty diagnostics/analyzing tech manufacturer Nurugo; more on these two companies further down the article! And now read on for a list of my favourite brand discoveries. As always, the brands are listed in no particular order. 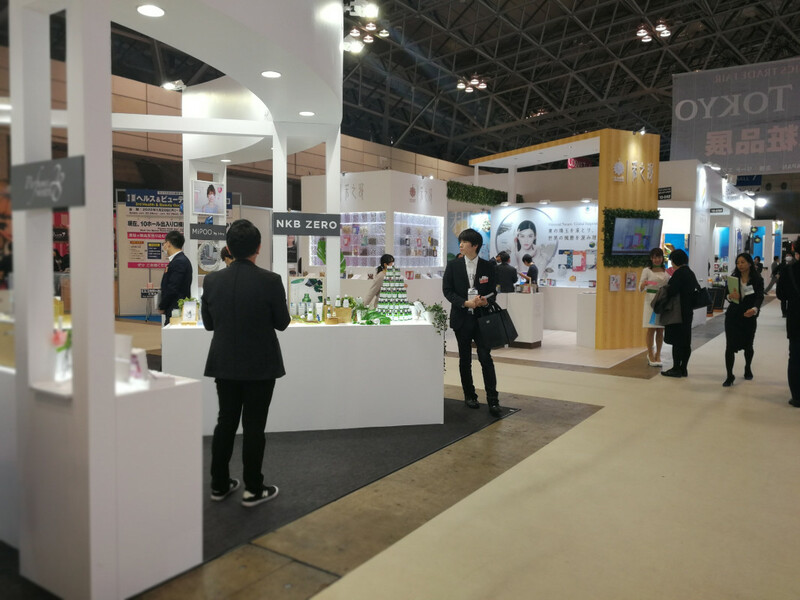 During this trade show I focused on Asian brands and tried to sort of group them according to country – starting with Japan, then Korea, then Taiwan; followed by a couple of other countries Enjoy! 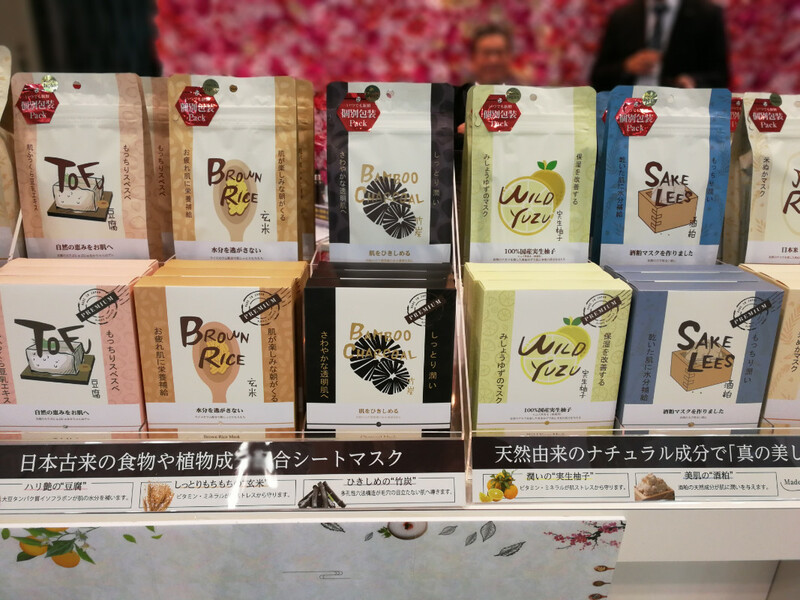 Japanese C&T manufacturer Comeitto selected a very traditional ingredient for its new Komenuka range: rice bran. However, the products don’t contain just any old rice bran – no, Comeitto is using organic rice grains that are carefully polished and prepared by a rice master – yes, there are rice masters in Japan. These are craftsmen who usually come from families that have been cultivating and working with rice for generations. Anyway, the Komemuka range skin care is based on rice bran and rice bran water. 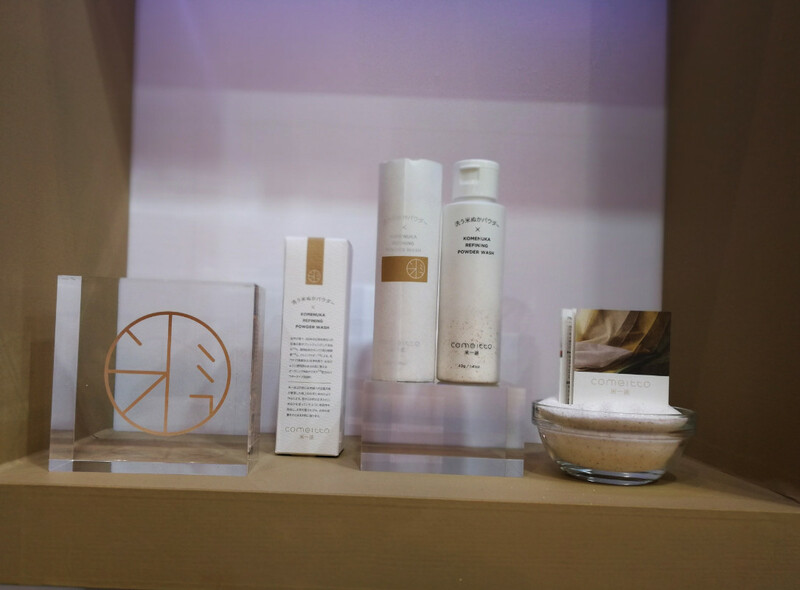 The line-up comprises four beautifully packaged face care products: Komenuka Refining Powder Wash is based on organic rice bran and walnut shell powder. The powder is mixed with water and will then foam up (not sure which ingredient is responsible for this?). The second treatment step is what I initially thought was a tea bag for drinking, but no: the Komenuka Starter Tea Bag (see the middle of the pic below) is a sachet filled with rice bran powder which is submerged into warm water and the resulting milky liquid is then applied to the face as a first hydrating step. How cool is that?! What a brilliant and very simple product idea. And yes, of course you can drink the remaining liquid so I guess it IS kind of like a normal tea bag. 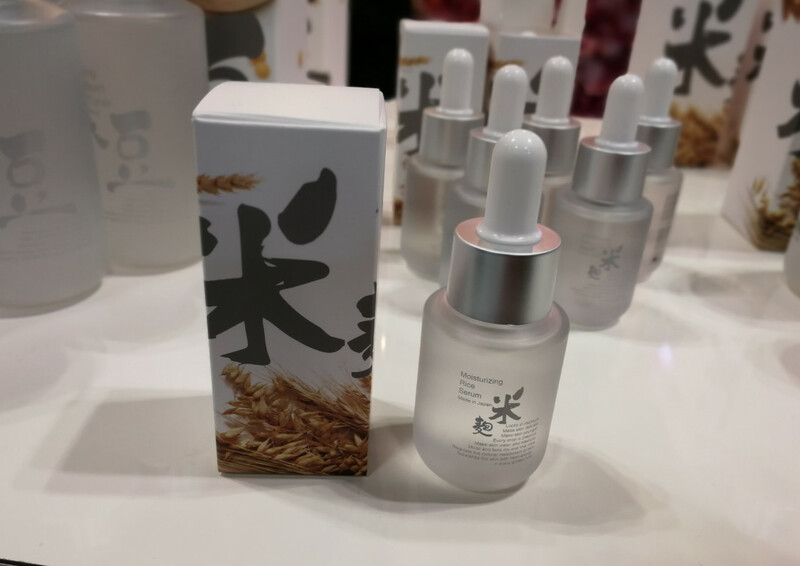 Step #3 is the Komenuka Brightening Rice Water: a soothing and hydrating milky essence toner which is based on 80% organic rice bran water. The final treatment step is the Komenuka Hydrating Concentrate which is a soft fresh cream formulated with, again, organic rice bran. Several of the ingredients are certified by Ecocert and the range is also certified cruelty-free. And while the product formulas are not certifiable organic, they are clean and near-natural. I really like Komenuka’s brand concept. I was told that the products are already available in selected Urban Comfort stores in Tokyo and the price range is 3,000-4,000 JPY (around 23-25 Euro). 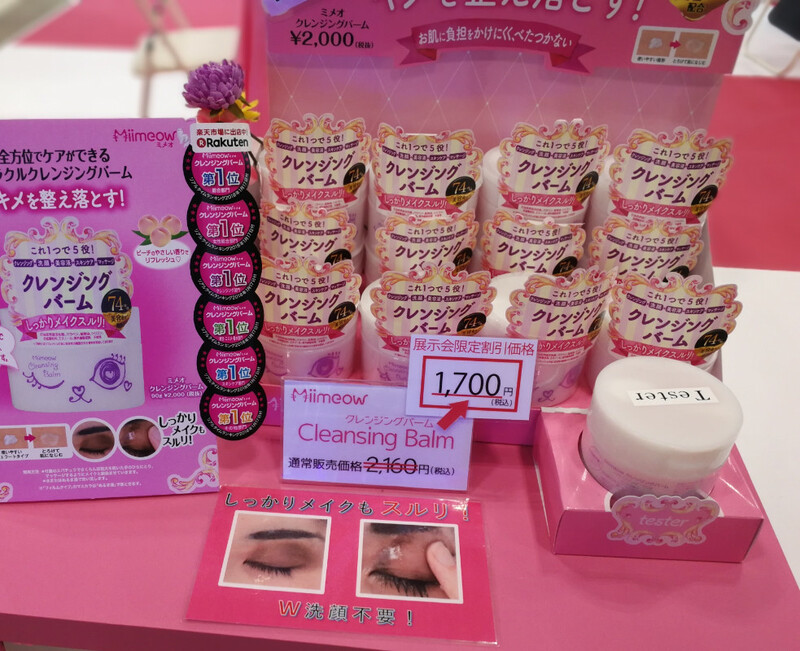 Sincere Beauty is a new 6-sku sheet mask range in the product portfolio of Japanese C&T manufacturer Sincere Laura. The Sincere Beauty masks are formulated with classic Japanese ingredients such as yuzu fruit, bamboo charcoal, sake lees, brown rice, white rice and tofu. Each sheet mask variant is available in three pack sizes; 6 masks, 10 masks and 31 masks. And the beautiful retro-looking packaging (love it!) enhances the traditional character of this range. Sincere Laura is also the distributor of two other skin care ranges that were inspired by traditional Japanese ingredients. 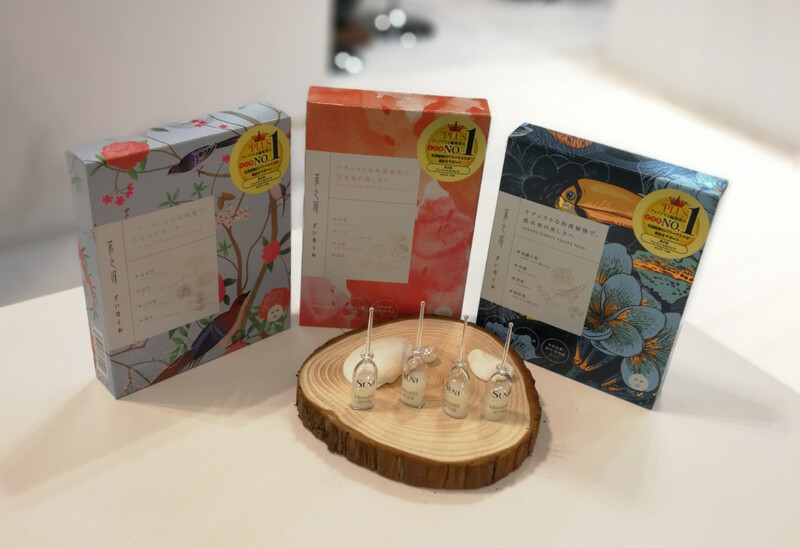 The Japan Traditional Series by C&T manufacturer Mitomo offers three product ranges: Moisturizing Rice, Glowing Soy Bean and Elastic Japanese Sake. 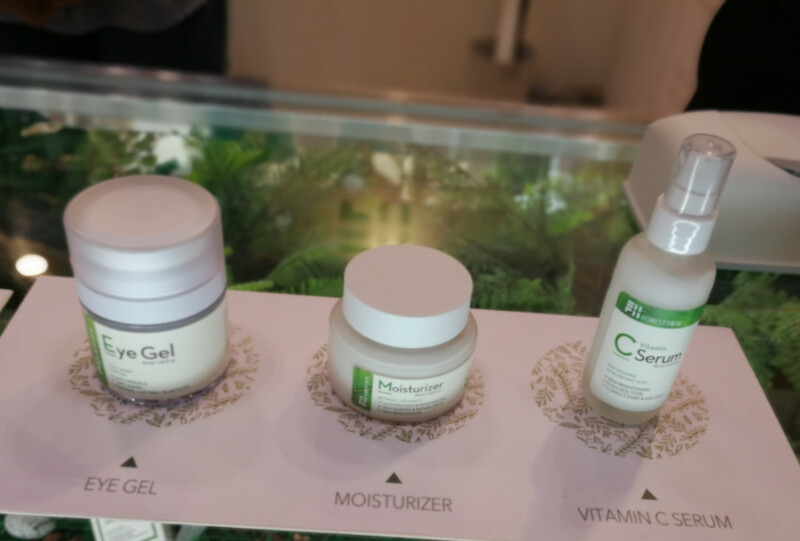 Each range comprises three products: toner, serum and peeling gel. Again, check out the ultra stylish packaging! 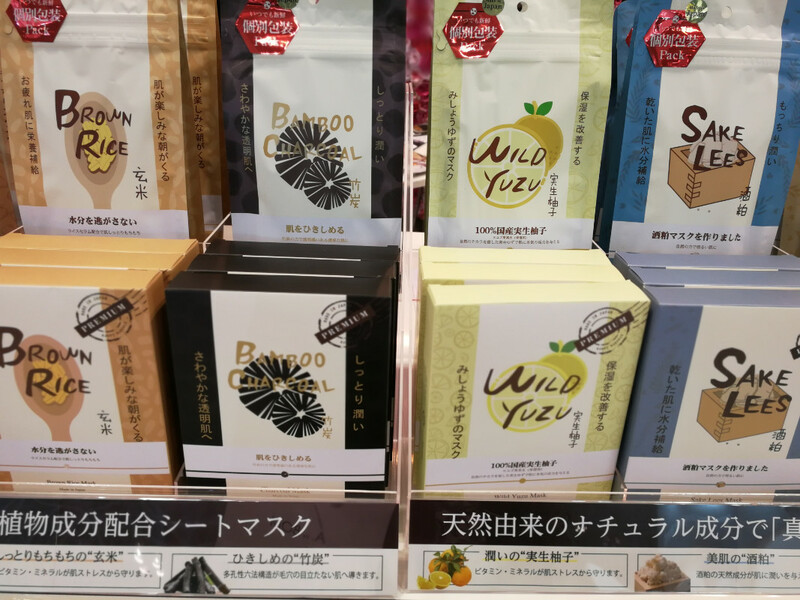 Mitomo also manufactures various ranges of ukiyo-e (traditional Japanese wood cuts) decorated beauty products. 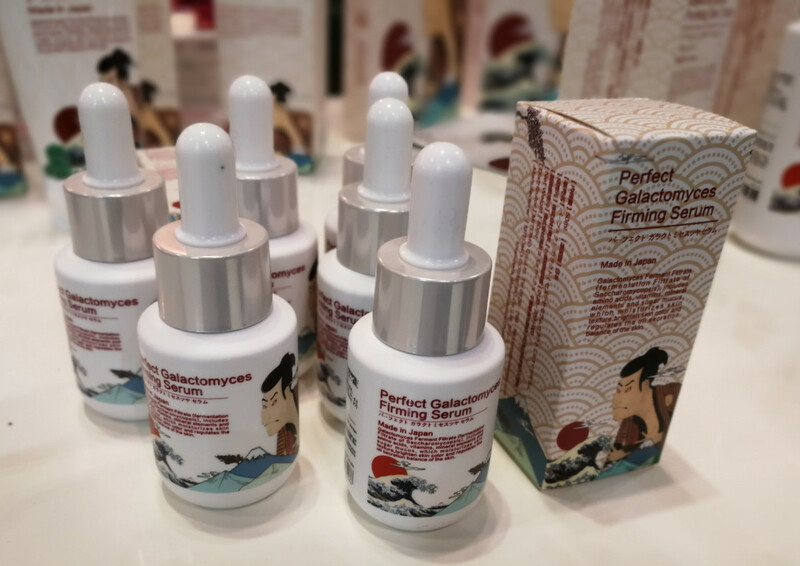 The company’s newest launch is the Ukiyoe Samurai range for men (see pic above): there are two sub-ranges which are both formulated with galactomyces ferment filtrate. 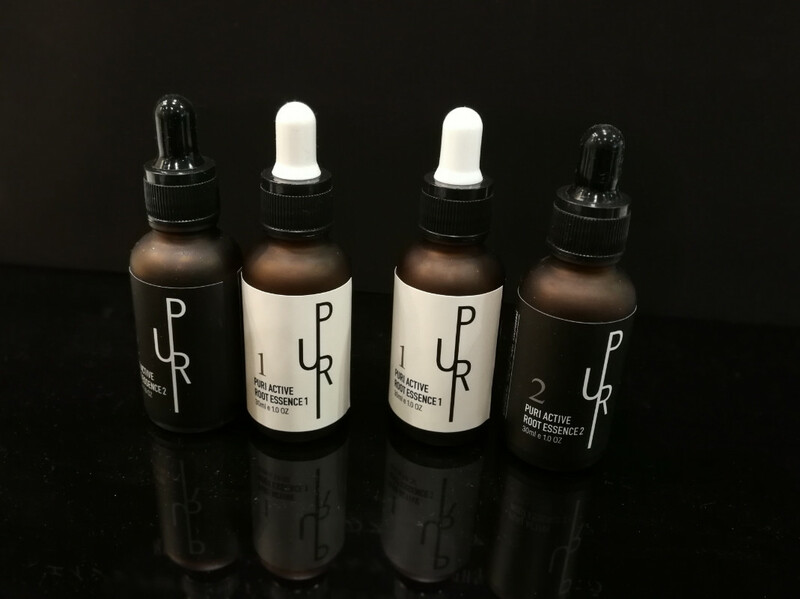 Each sub-range comprises four products: sheet mask, peeling gel, skin toner and firming serum – the range packaged in black is the Purifying Galactomyces range, the products in the white packaging (see pic above) are the Brightening Galactomyces range. I had seen the pastel-coloured tubes and bottles at Cosmekitchen stores here and there but never really looked at the products in more detail. The brand’s line-up includes a feminine wash, feminine wipes, whitening cream, lubricant, creams for legs, hips and breasts, a massage oil and a 3-sku Birthing range developed especially for pregnant women. 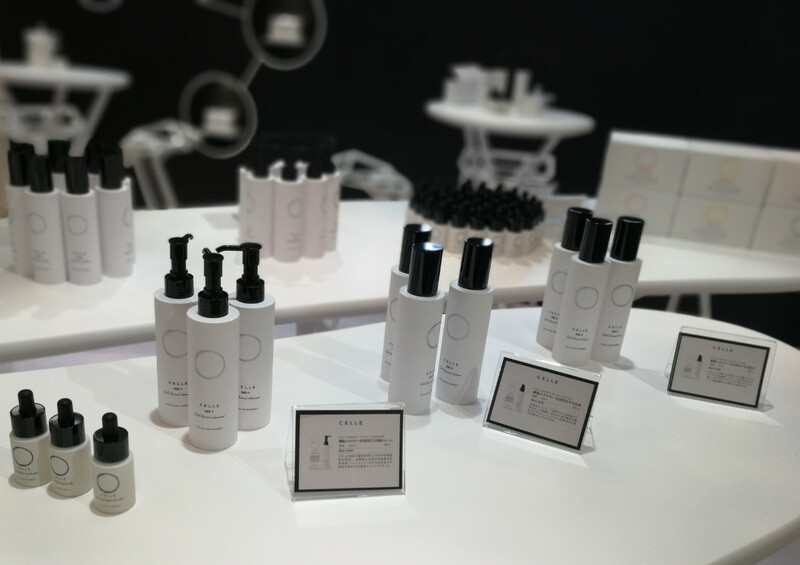 Intime Organique’s products are formulated according to phytotherapeutical principles – the brand’s founder Atsuko Morita is a trained phytotherapist – and the packaging is pretty and feminine-looking. The company behind Intime Organique, St. Louis International, is also manufacturing many of the Cosmetkitchen own label herbal lotions and sprays that you see in Cosmekitchen’s naturopathy sections. 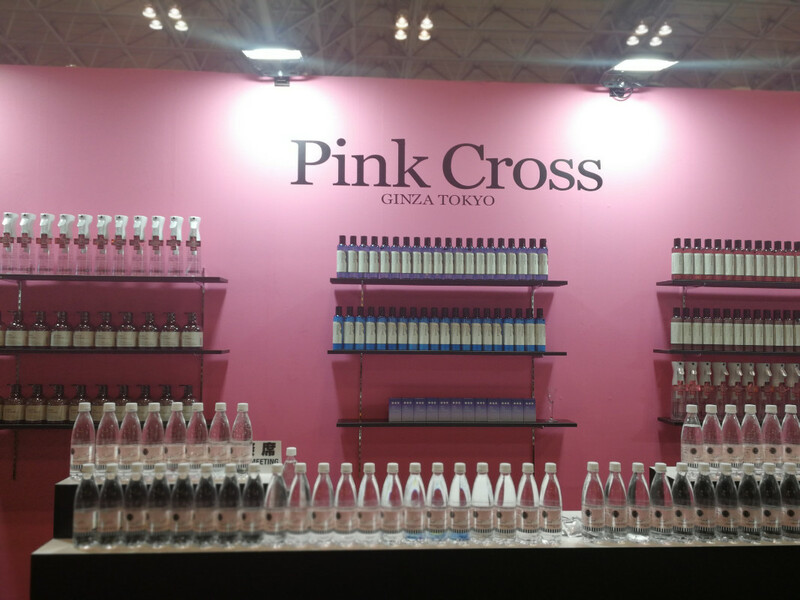 Pink Cross is a lifestyle and beauty brand which was launched by fashion designer and makeup artist Takashi Mizuno in 2003. Mizuno’s product range covers beauty, hair care, supplements and health beverages which are sold in selected Tokyu Hands, Loft and Plaza stores and also in his own store in Ginza. 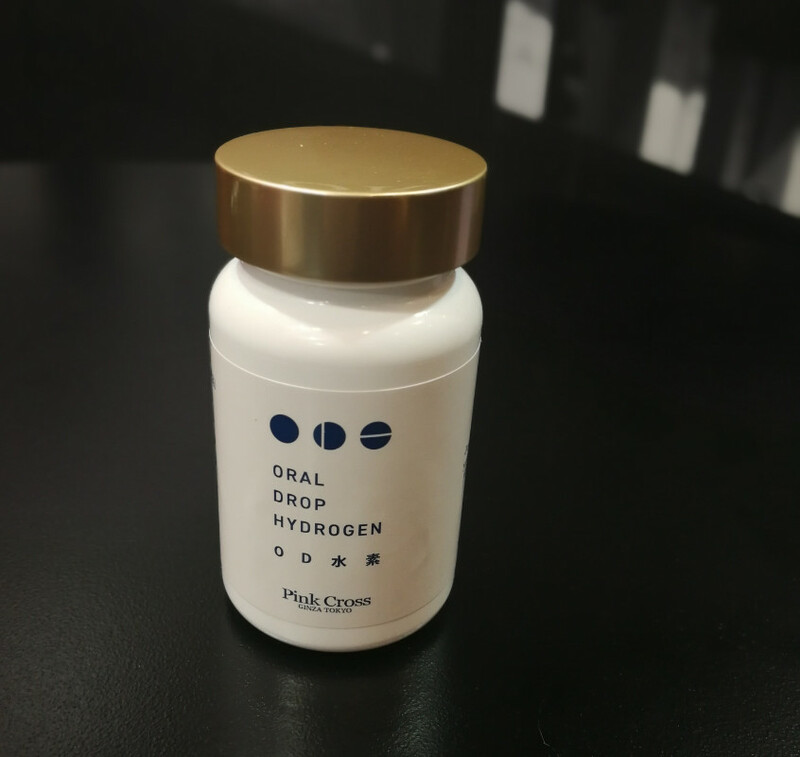 Mizuno’s latest launch is Oral Drop Hydrogen, a lemon-flavoured compressed powder tablet (see pics above) which is said to increase hydrogen levels in the body and thus help against oxidative stresses; boosting well-being and health and therefore happiness. 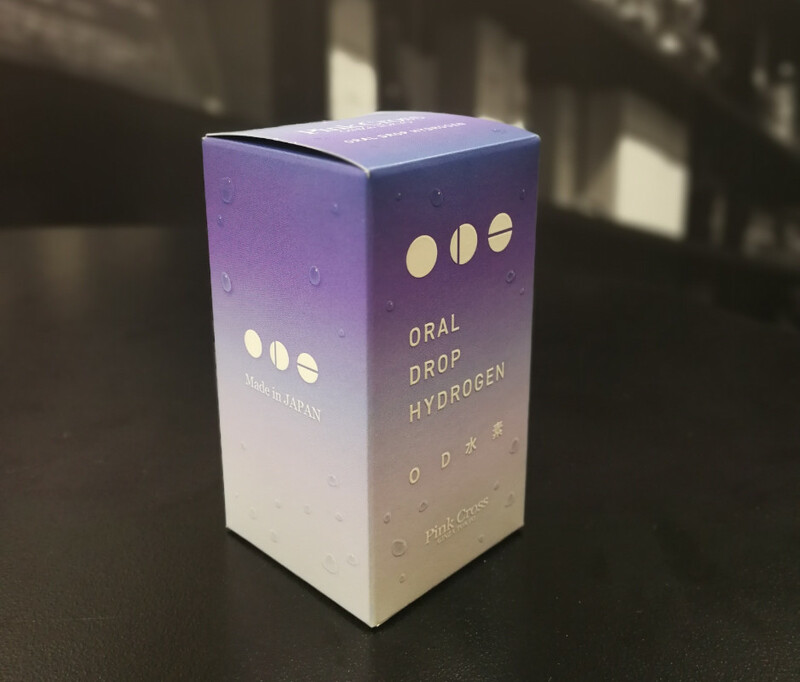 I tried out one of the hydrogen tablets and they’re not half bad! Refreshing lemon flavour and ever so slightly fizzy on the tongue, like a very mild sherbet. 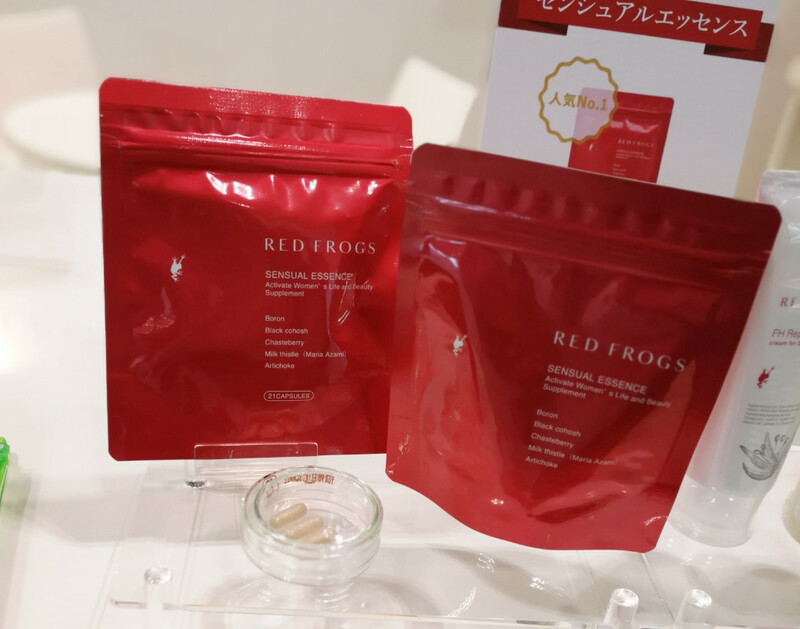 Red Frogs was another interesting Japanese brand: the company specialised in phytotherapy-based skin care and beauty supplements for menopausal women. The range of this new brand includes five products. The Sensual Essence supplement capsules (see pic below) contain cabbage-derived boron, cranberry extract, Black cohosh extract, milk thistle extract and artichoke extract. 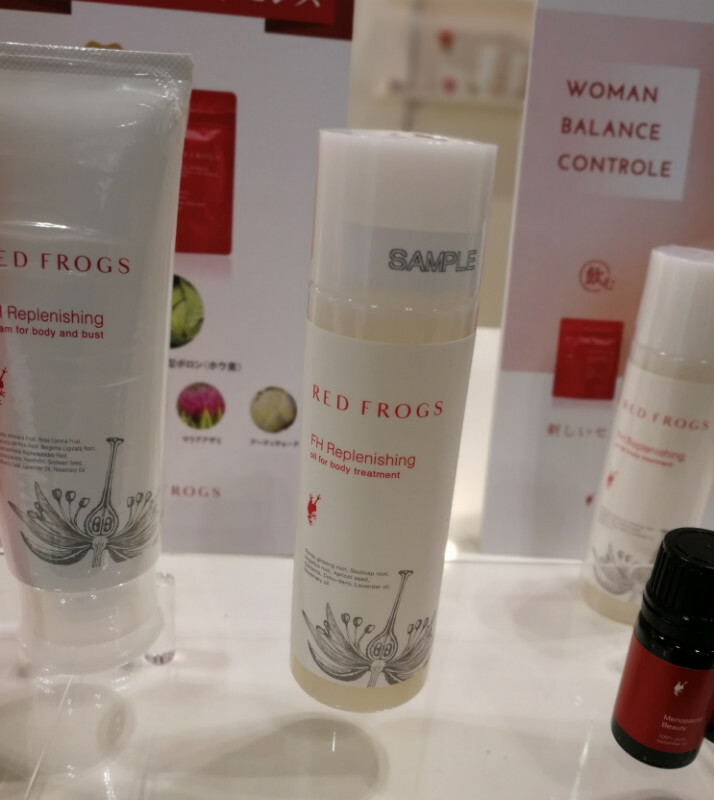 The line-up also offers a rich body cream and body lotion and two essential oil aromatherapy blends, Menopause Beauty and Power Rose, which are claimed to balance and soothe mind and body, helping to alleviate some of the symptoms of menopause. 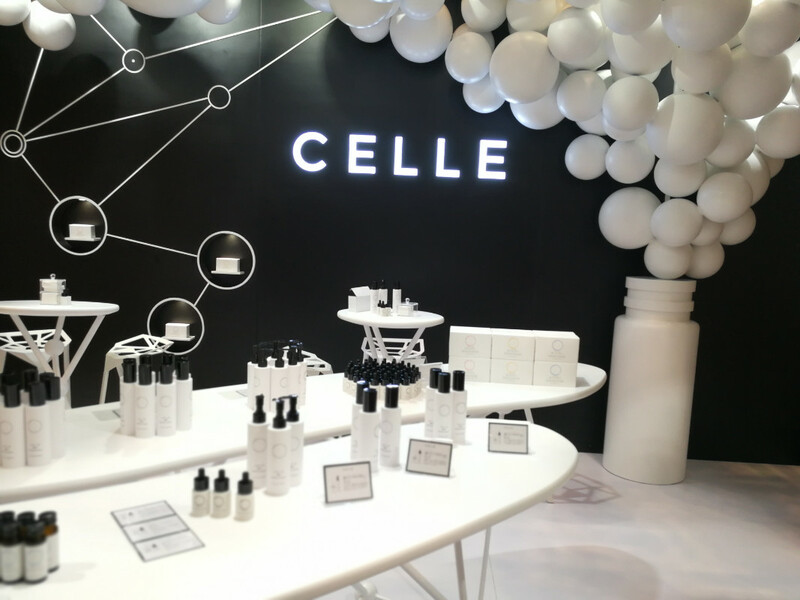 Japanese beauty brand Celle had an eye-catching exhibition booth at Cosme Tokyo, all black and white and decorated with balloons. The 7-sku product range will launch in March 2019, I was told, with branded stores across Japan. 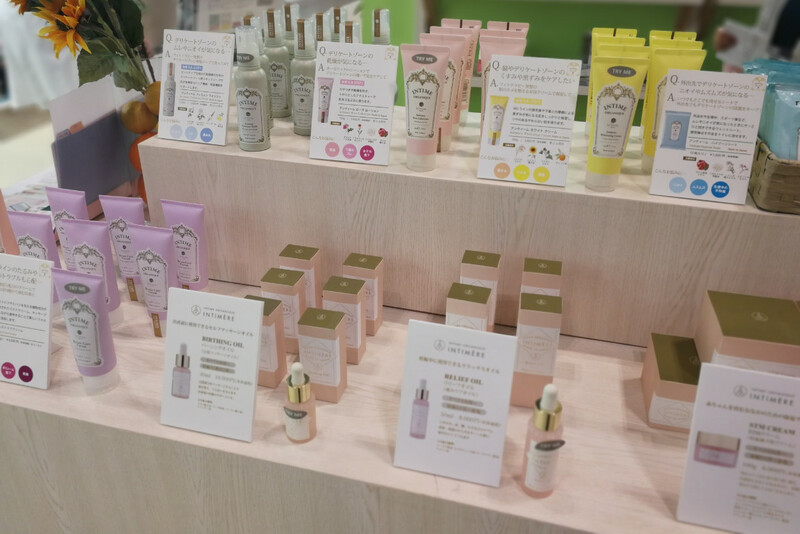 The line-up includes a booster serum, a cleanser, lotion and toner and – since this is a Japanese skin care brand – three beauty supplements. The active ingredient is fish collagen which is said to be more easily absorbed by the skin than collagen derived from other sources. Manufacturer Beautunnel claims that the Celle supplements are the first whitening beauty supplements in Japan (or at least that was what their English-language brochure said); they contain fish collagen as well as skin-brightening niacinamide. 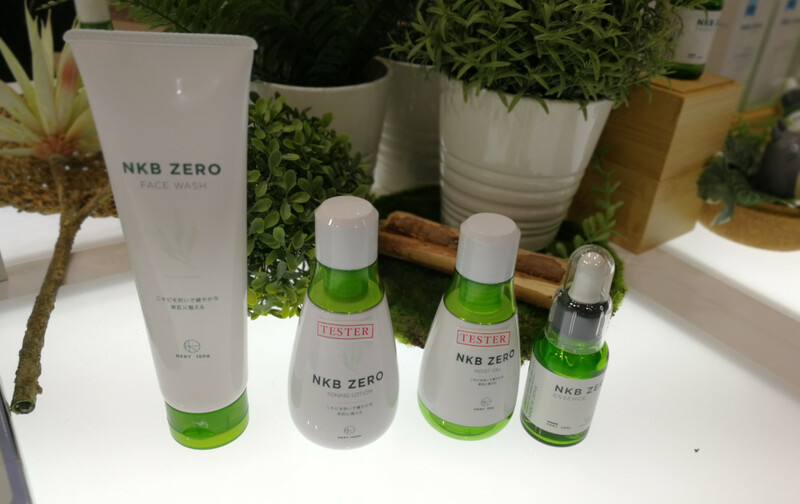 NKB Zero is a face care range for impure and acne-prone skin which was launched three years ago. 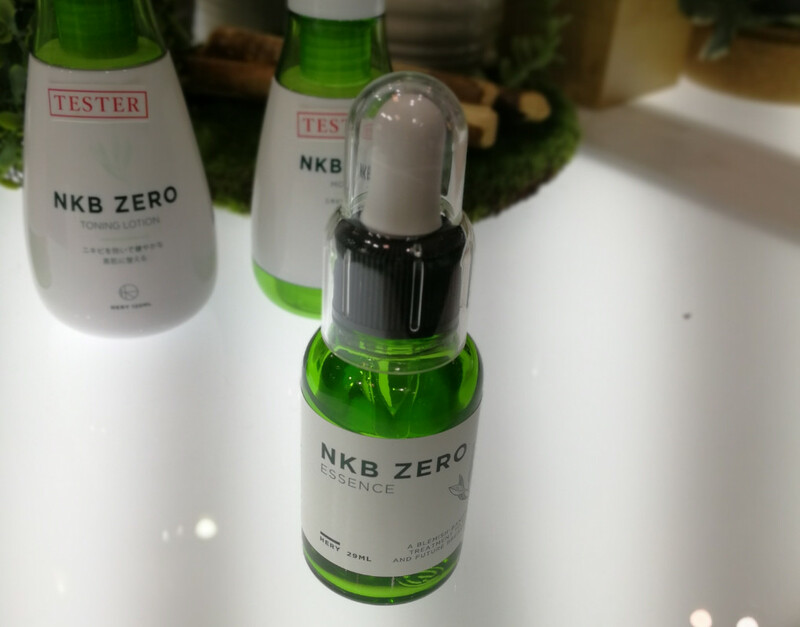 The brand’s star products, the Zero Essence (see pic below), is a clear serum is packaged in a dropper bottle and contains a range of plant extracts, including licorice root, bilberry fruit, pearl extract and hyaluronic acid to tackle acne-causing bacteria without drying out the skin. 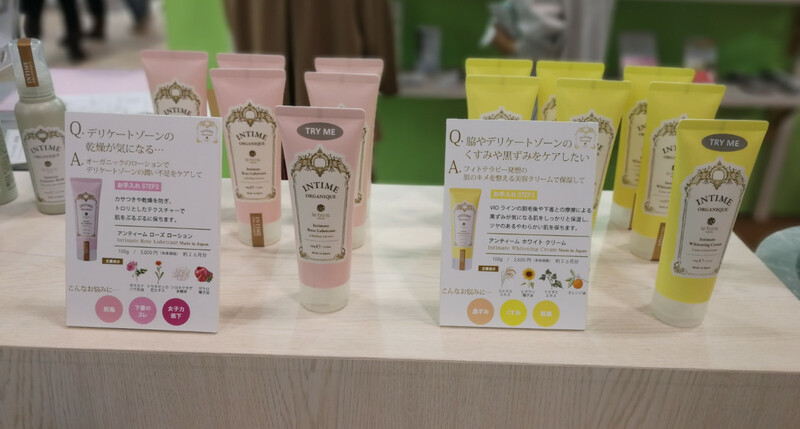 With a clean formula and eco-inspired packaging Japanese manufacturer Hery’s launch falls squarely into the clean/green beauty trend which has been picking up pace in Japan over the past few years. 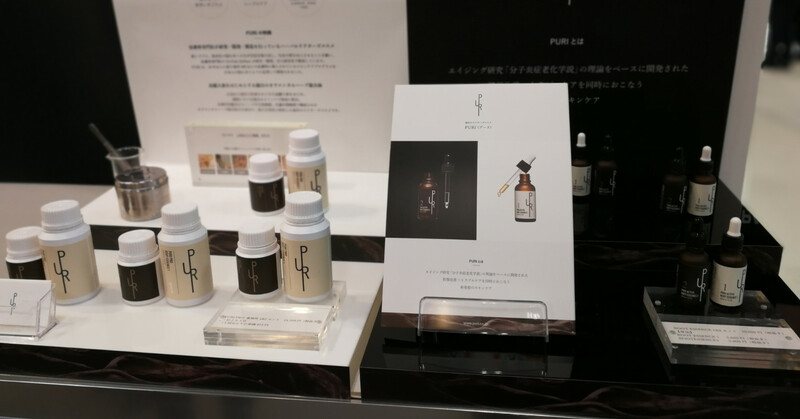 Japanese skin care brand Puri also specialises in anti-acne products. 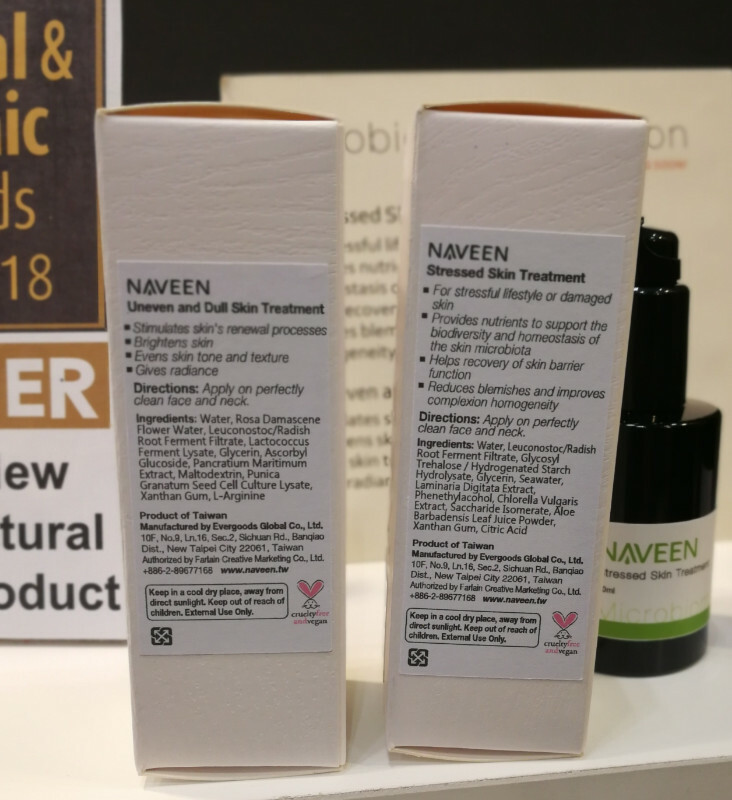 In the case of this very new niche brand (Puri was launched in January 2019) the active ingredient is ginseng extract and there are two different ranges: one for “younger” hormonal acne and the other for mature acne skin – finally a beauty brand which recognises that acne and impurities can strike at any age and are by no means confined to teenage skin! Puri’s product formulas were developed in Korea by a Korean herbalist doctor but the products are manufactured in Japan. The key ingredient is ginseng root extract (plus other traditional root extracts) and there are two ranges. Active Root Essence 1 contains the primary anti-acne plant extracts, Active Root Essence 2 includes more skin-calming and soothing ingredients. 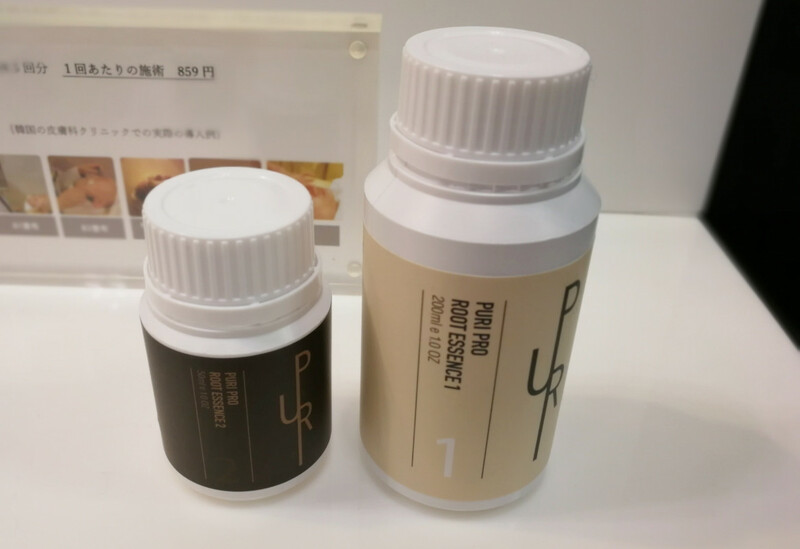 Puri Pro, packaged in plastic bottles (see pic above), is the range for younger acne skin. The herbal blend in this range is slightly stronger than in the regular Puri range. Again, the liquids should be applied in order; first the stronger, more active anti-impurities treatment, the the more soothing herbal liquid. The liquids totally look and smell like plant tinctures; the colour is a yellowish brown and there is a strong, herbal smell (luckily I like the smell of ginseng). The packaging of aromatherapy hair care range Feather Aqua is beautiful. It’s relaxing to merely look at it! The brand is very new (it was launched this January) and the range includes eight products divided into four range: Gentle & Soft, Scalp Care, Moist & Repair and Extra Smooth. All products contain amino acids, hibiscus extract, swertia japonica extract and moisturising red algae extract and each shampoo and conditioner duo has been scented with a special aromatherapy fragrance blend. Gentle & Soft, for example, is scented with fresh citrus notes (light grey packaging), Scalp Care (darker grey) combines green florals with woodsy notes, Moist & Repair (light pink) has an uplifting floral scent and Extra Smooth is an aromatic and slightly spicy floral blend. Miimeow was launched in 2016 and the product comprises three sku: peeling gel, cleansing balm and peeling socks. The Miimeow product are already bestsellers on @cosme and Rakuten (but are also available offline, for example at Don Quijote and Tokyu Hands) – and why wouldn’t they? Fun and cheerful and oh-so-cute – pure kawaii! 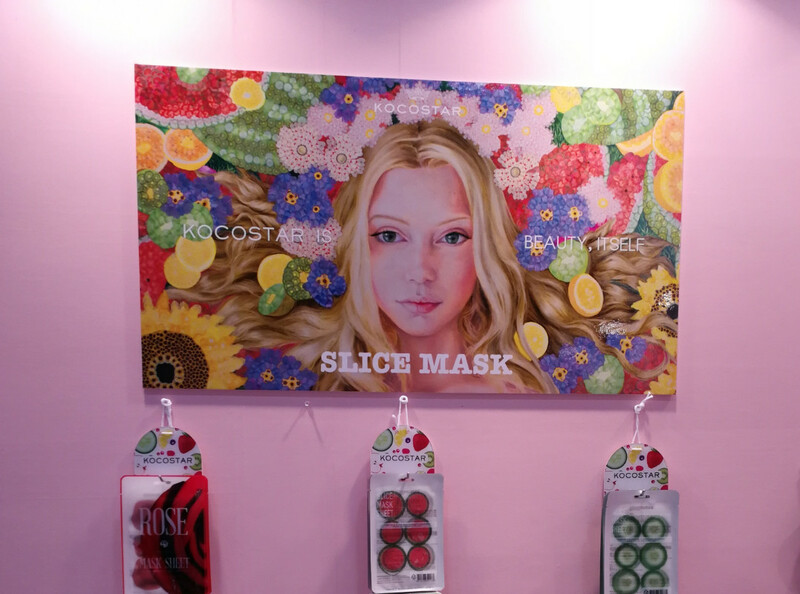 And while we’re on the topic of kawaii: the sheet mask range you see in the picture below is called Roots of Kawaii and features the anime-style drawings of iconic Japanese illustrator Rune Naito. Naito became famous in the 1960s for his depictions of typically Japanese girls; bambi eyes, very feminine, very pretty. He died in 2007 but recently his artwork has become popular again, so Japanese C&T manufacturer Japan Gals decided to launch this commemorative range. By the way; Japan Gals is also the manufacturer of a new organic beauty brand which will be launched this March/April in Tokyo. Waganic is made in Japan, obviously; with regional ingredients and packaging manufactured from Japanese bamboo wood. Can’t wait to see the products! Retail channels are not yet decided on, but I seem to remember branded stores being mentioned which would be pretty cool. 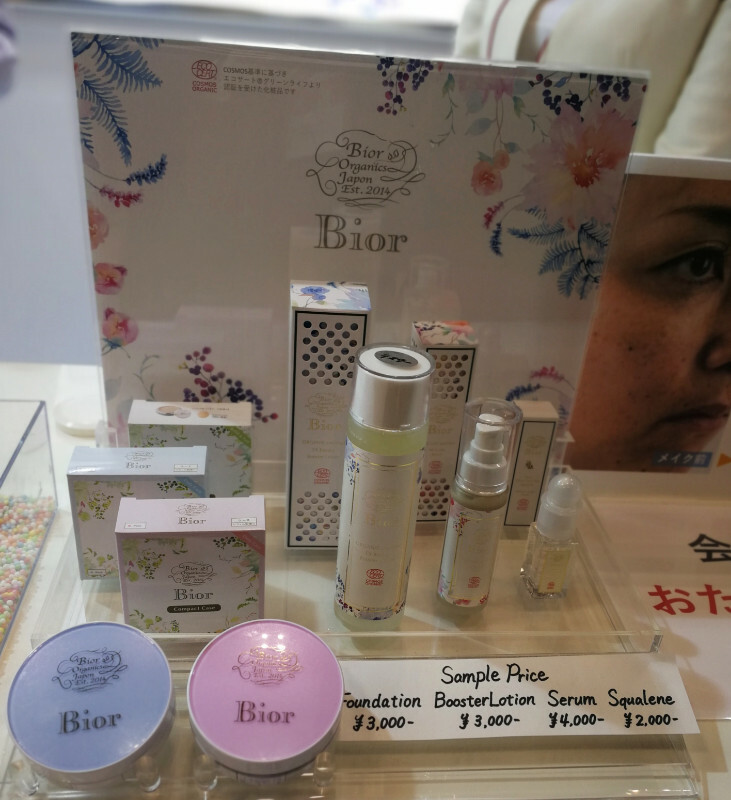 Japanese skin care brand Bior is certified by Ecocert. I’d seen the products around but had never looked at them more closely. 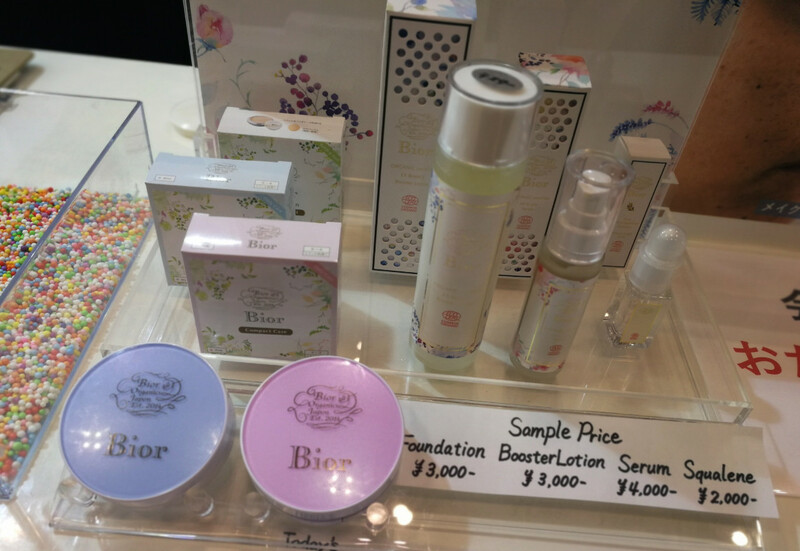 However, the company was at the trade show so I checked out the Bior products in more detail. Bior was launched in 2014 and the line-up offers four products: a cushion compact with SPF50++, a bottle of pure olive squalane, the All-In-One Serum and the Ex Booster Lotion. The cushion isn’t certified (some of the ingredients are, but the actual entire product isn’t, as far as I could tell), the olive squalane is Cosmos Natural while Serum and Lotion are Cosmos Organic. The All-In-One Serum appears to the the brand’s star product; it contains Bior’s proprietary Plantolin complex, a skin care blend which is based on the native Australian plant Centipedia Cunninghami (CC). Besides Plantolin the Serum contains rice peptides, shea butter, argan oil and olive qualane plus plum fruit water (the second ingredient in the INCI listing, after water and before olive squalane), rosemary and thyme essence and sage essence. The natural product fragrance is based on essential oils (again, this is from Google Translate! ), a blend of citrus, lemongrass and tea tree. Lovely texture, non-sticky and moisturising. The Booster Lotion is a liquid toner essence and is based on water and plum fruit water as well as plant-based hyaluronic acid, squalane, white fungus saccharides and, of course, the Plantolin complex. The cushion foundation also contains Plantolin as well as soy bean derived ceramides. The rest of the ingredients (at least in the Google Translate version) look highly synthetic. Forest Heal from Korea is an interesting beauty brand. The range was launched in 2018 and the line-up comprises six products – Vitamin C Serum, Moisturiser, Eye Gel, Witch Hazel Facial Toner, Whipping Foam Cleanser and Sugar Face Scrub – which are vegan-certified, cruelty-free certified, eco-friendly and formulated with plant ingredients; clean beauty rather than organic. However, the unusual thing about Forest Heal is that Korean C&T manufacturer Bonne (the group behind popular colour cosmetics brand Touch in Sol) developed the range exclusively for sale on Amazon US; based on the most popular search terms entered by Amazon customers in the online store’s interface! The two newest Forest Heal launches are the witch hazel toner and the sugar face scrub and there will be a new peeling/scrub product soon. 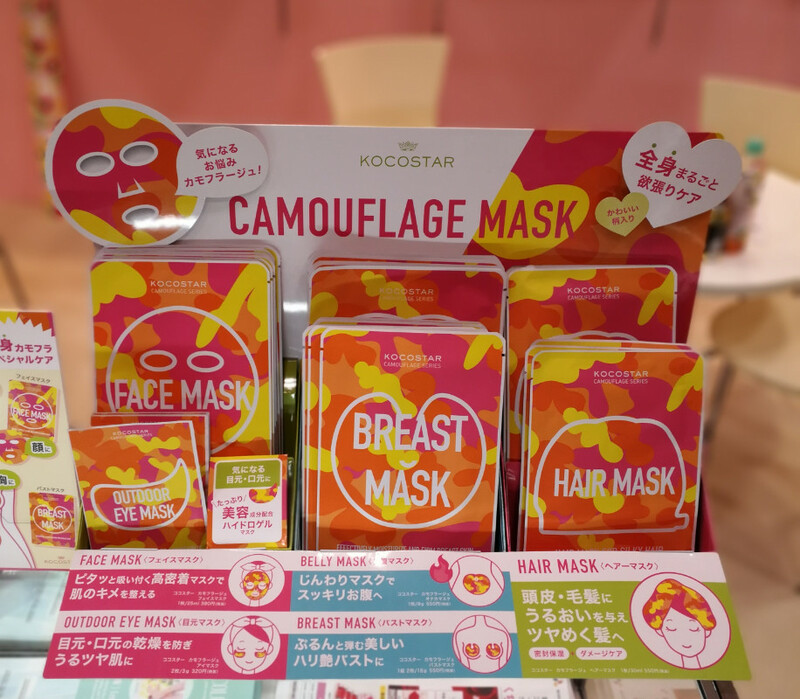 And here is another retailer-exclusive product range from a Korean brand: Kocostar and its 9-sku Camouflage sheet mask range for face, body and hair which was launched last year for perfumery chain Sephora’s European retail business. The beautiful Kocostar poster you can see in the picture above was designed by Chilean artist Alonsa Guevara and I think it fits Kocostar’s brand identity of the company perfectly. Check out the complicated red and gold packaging! 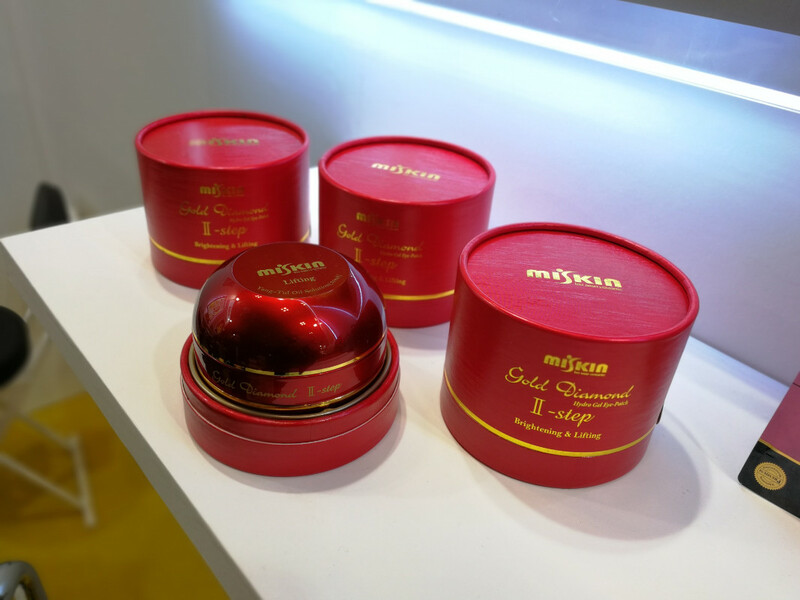 This is Korean anti-ageing brand Miskin and its newest product, the Gold Diamond II-Step Hydro Eye Gel Patch & Cream. The two products, undereye hydrogel masks and moisturising cream, are packaged in the same container. The base contains the gold-coloured eye masks, the lid for this container forms the base of the cream jar which in turn is closed by the dome-shaped lid. The entire thing is then enclosed by a cardboard tube. 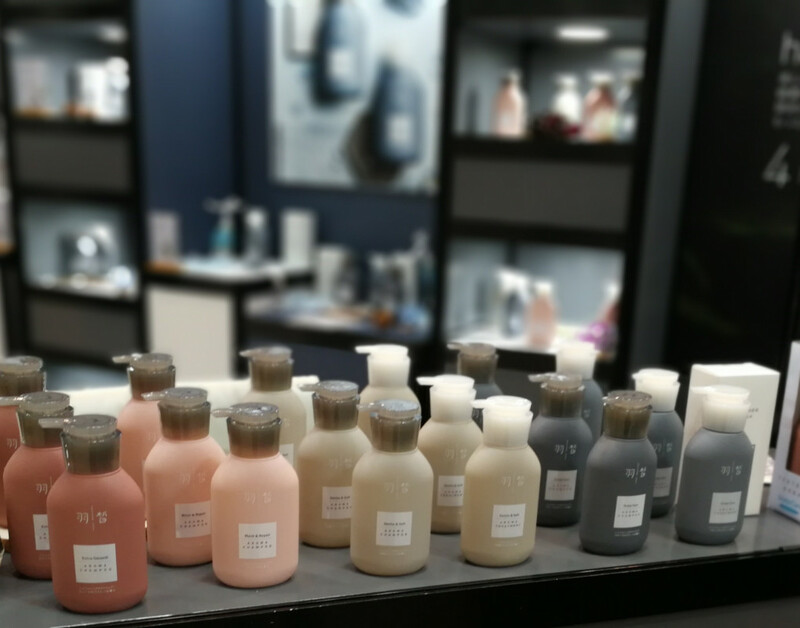 Miskin is primarily sold online in Korea and the company is now exploring the Japanese market, hence their presence at Cosme Tokyo. I wonder whether the voluptuous packaging will strike a chord with Japanese consumers…? 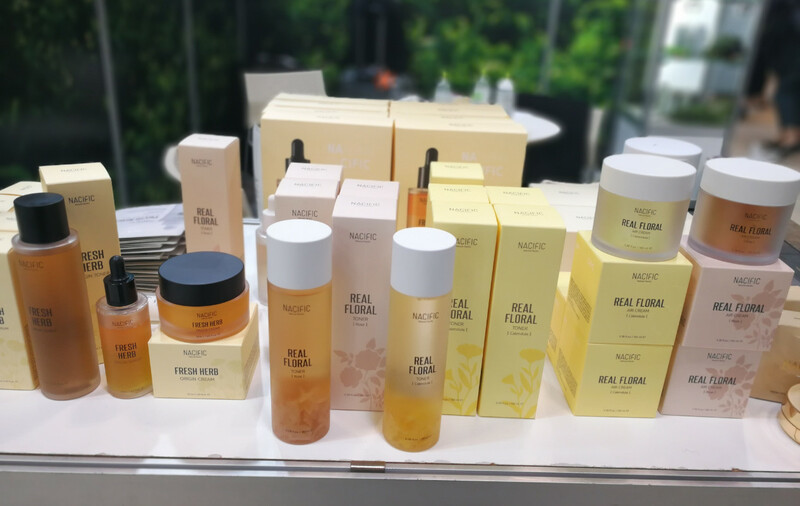 Nacific is a natural beauty range from Korea. I was told that the brand had been at last year’s Cosme Tokyo, but the range was then called Natural Pacific so this appears to have been a brand relaunch. Anyway, the range looks gorgeous and although the natural-ness varies from product to product most of them seem to be near-natural at the least while quite a few are almost organic. Ok, so this brand was launched (or relaunched) in May 2018 with a portfolio of around 27 sku of face care, divided into several lines. First there is the every day skin care range Fresh Herb with a total of 12 products (toner, cream, serum, eye cream, sun block, cleansing gel, cleansing foam, cleansing water, pre-saturated toner pads, sheet mask, spot patch, cushion foundation), then the brightening Phyto Niacin range with four products (essence, toner, cream sheet mask), Real Floral (4 sku for that extra natural touch: two toners, two creams), Fresh Cica (problem and sensitive skin; 3 sku: serum, toner, treatment cream) and Glow Intensive (rejuvenating products for tired and more mature skin; 2 sku, toner and essence). The two toners in the Real Floral range contain actual flower petals inside the bottles which looks really pretty. The newest products in the range are the Fresh Herb Clear Spot Patch (tinted anti-pimple patches) and the Fresh Herb Origins Cover Cushion. 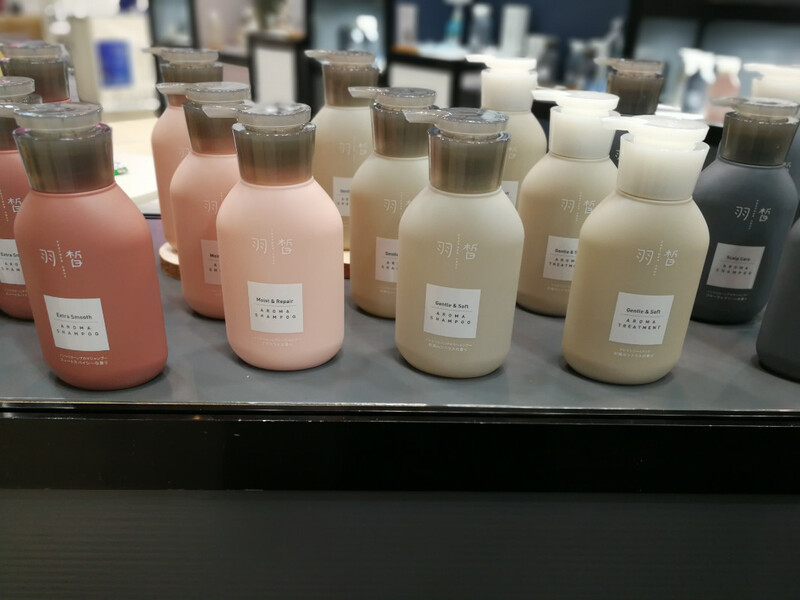 I asked about the brand’s retail channels, international presence and so on and was told that in Korea, the Nacific products are available online and offline (in LOHBS drugstores and some duty free stores). The brand is also sold in Indonesia (where Nacific has a pretty solid retail presence), in Cambodia, Malaysia and the Philippines but also in the US through Sokoglam (online) and Costco (online/offline). 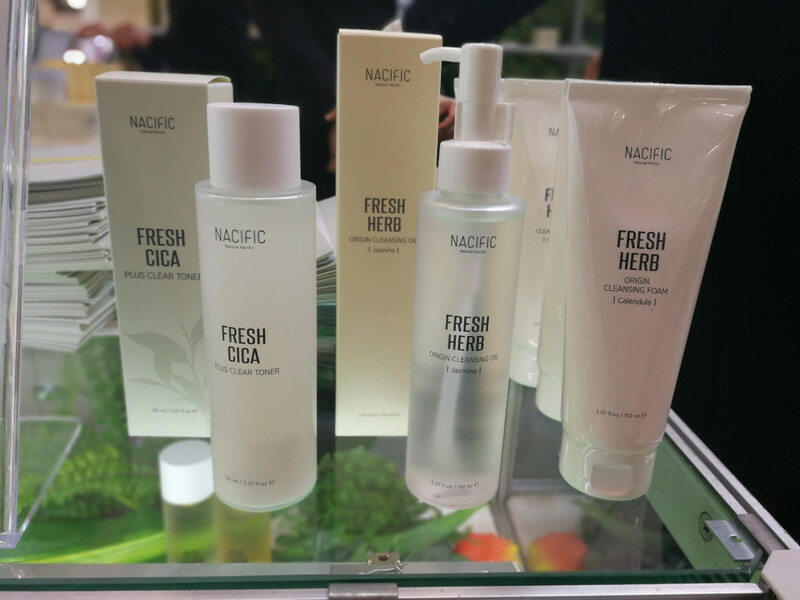 Nacific is also currently registering its products for sale in the EU so from May 2019 onwards the company will be exploring the European markets, with a particular focus on the UK and Russia. Well, let’s see how the whole UK/Brexit thing works out and whether Nacific (or any other Asian brand that is going through the CPNP registration process this year) will actually be able to sell in the UK? Like, at all? Incidentally, whenever I ask Asian exhibitors at trade shows which of the European markets they are particularly interested in, they often mention the UK as a first choice. If it’s an organic or natural brand, their first pick will usually be the Continental Western European markets such as Germany, France, Italy or Spain. Korean sheet mask range Superfood Salad for Skin has such a great brand concept! 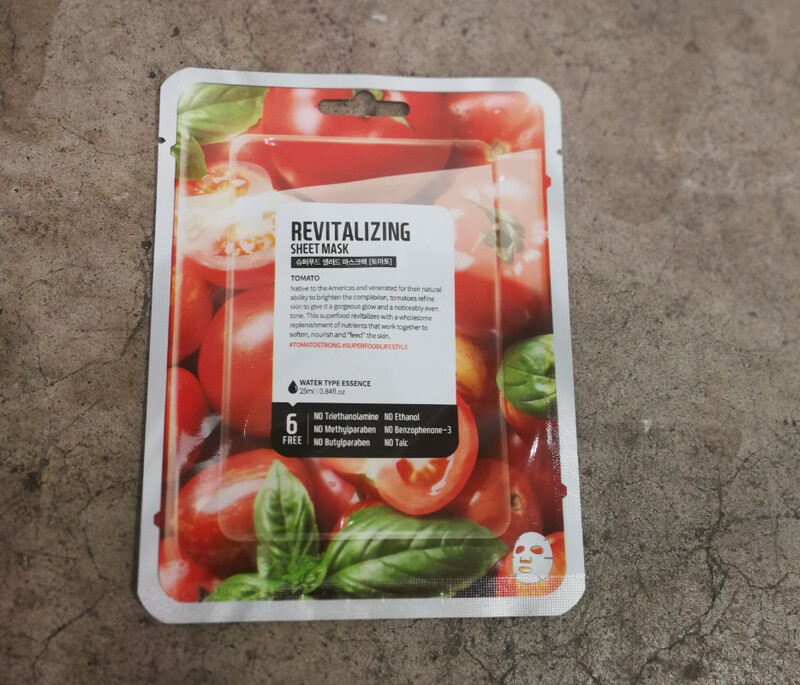 The brand was launched in August 2018 and each of the 12 sheet masks has been formulated with a specific fruit or vegetable extract, including olive, avocado, coconut, kale, blueberry, honey, tomato, carrot, broccoli, green tea, beetroot and mangosteen. Plus colostrum extract as the key ingredient in the entire range. However, there’s more! The brand offers four mask packs which each contain a mix of seven masks. The packs look EXACTLY like the take-away salad containers that you can find in any convenience store or supermarket and the label is decorated with a mouth-watering picture of a salad bowl featuring the key ingredients of the masks that are included in the individual pack. 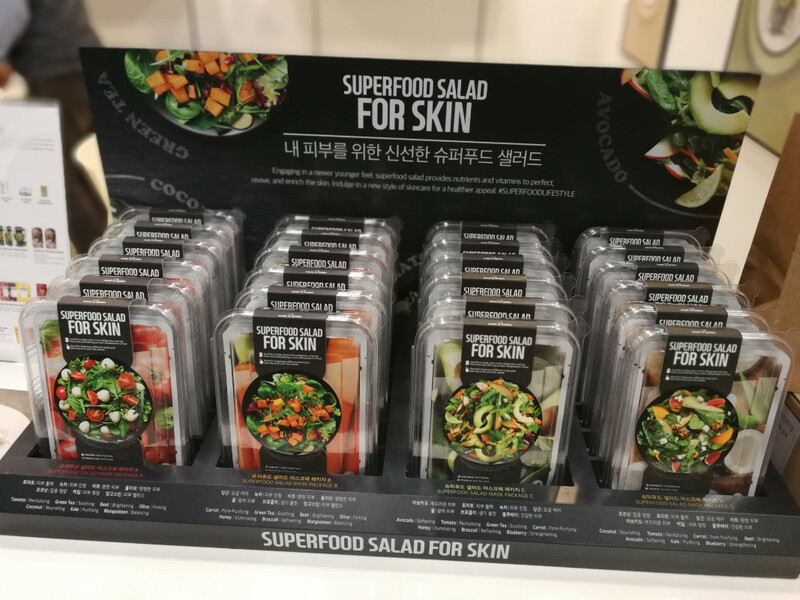 Superfood Salad sells in eight international countries already, including the US, Canada and Mexico, Japan, China, Poland and Spain and I was told that starting in April 2019, the mask will also be available in Germany courtesy of the Douglas perfumery chain. 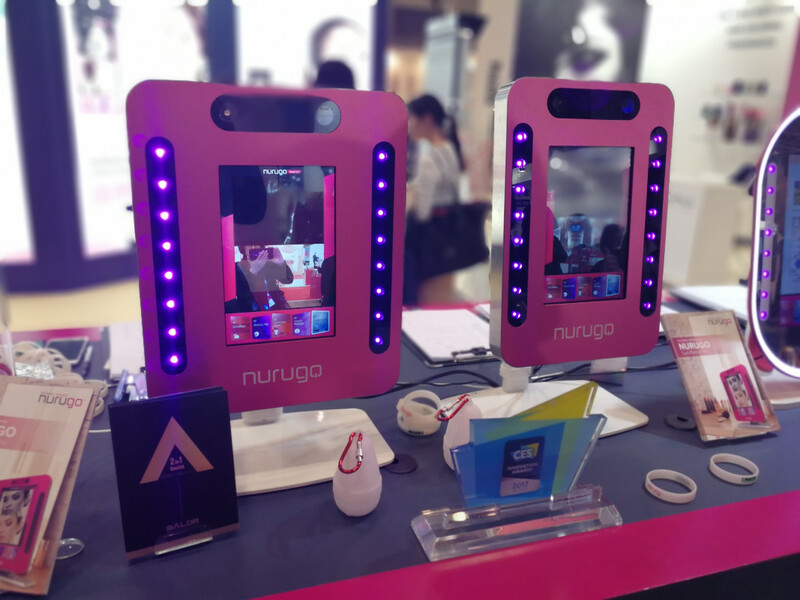 Nurugo is Korean biometric tech manufacturer Virditech’s beautytronics brand: a range of skin analyzer/diagnostic tools which are really cool. First there is the UV Protection Screen Mirror which shows you the state of your skin’s UV protection – the parts of face, neck, hands, whatever that are exposed to the sun without any protective cream or stick appear white, skin areas that ARE protected appear in black. This big mirror you see in the two pics below is a B2B product, designed for stores and salons. There is also a portable version which plugs into your smartphone. 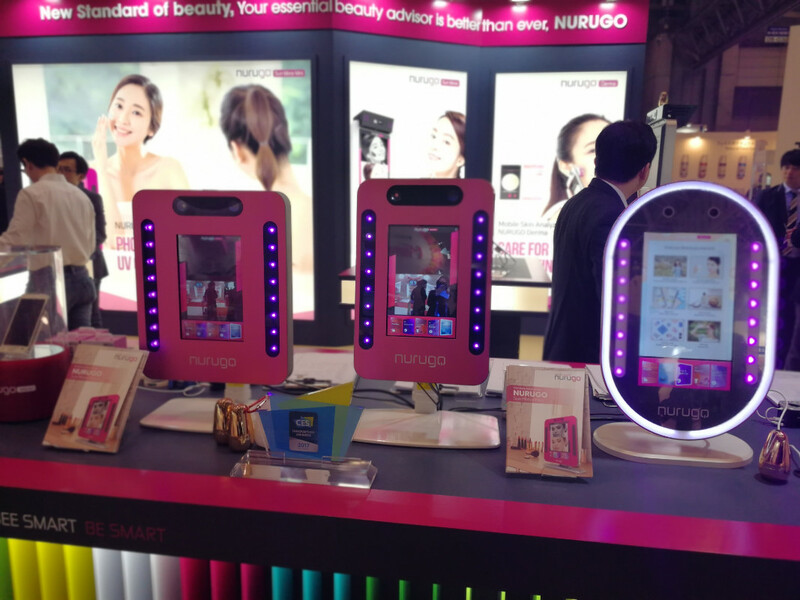 And there are two more electronic tool which I completely fell for, Nurugo Derma and Nurugo Micro. Spoiler alert: I went back to the booth the next day and bought both attachments at trade show prices! 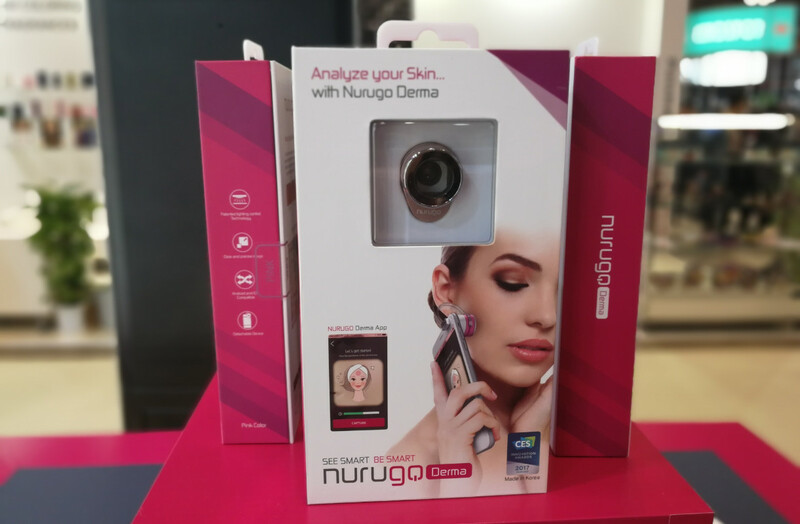 Nurugo Derma (pic below) is a skin analyzer which scans your skin and tells you the current state of oiliness, hydration, dryness, pore size and so on. The Derma is a small and elegantly designed gadget which is attached to your phone with a neat little bracket. Doesn’t need external batteries or charging cables, the internal battery is charged by the smartphone’s camera flash. 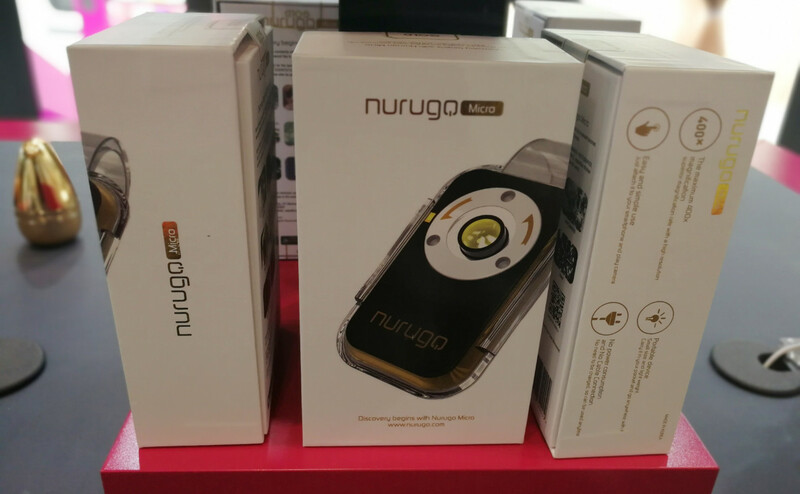 And Nurugo Micro (see pic above) is an awesome microscopic lens which you simply attach to your phone; same set-up as Nurugo Derma: it clips on with a bracket and is charged by the camera flash. The Micro lens magnifies for up to 400x; it really is fascinating: we tried it out on fabric, hair, skin – wow. As mentioned above I bought both gadgets the very next day: RRP are 50 USD for the Derma analyzer and 75 USD for the Micro lens. Disclosure of trade show discount: 20 USD and 30 USD respectively. Now, all I knew about A by Bom was that this Korean beauty brand’s sheet masks seem to be all over Instagram (and probably other social media too, but Insta is the only SNS that I use, so there!). 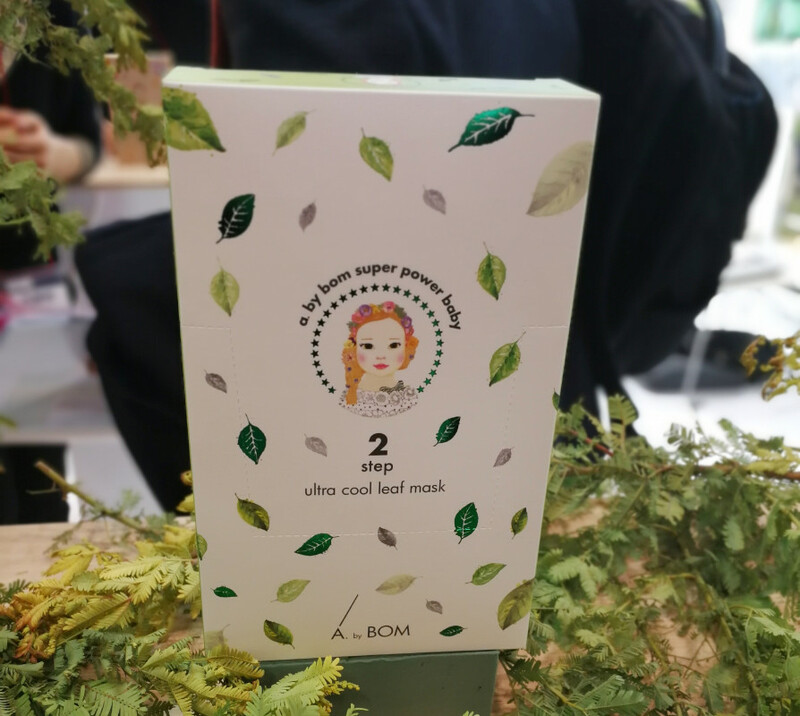 The company was a first-time exhibitor at Cosmetokyo so I used the opportunity to check out their poducts: there are the sheet masks, yes, but A by Bom also offers a range of skin care products and the packaging of their sheet masks is rather pretty. The A by Bom brand was launched in 2010 by a Seoul-based hair salon of the same name. 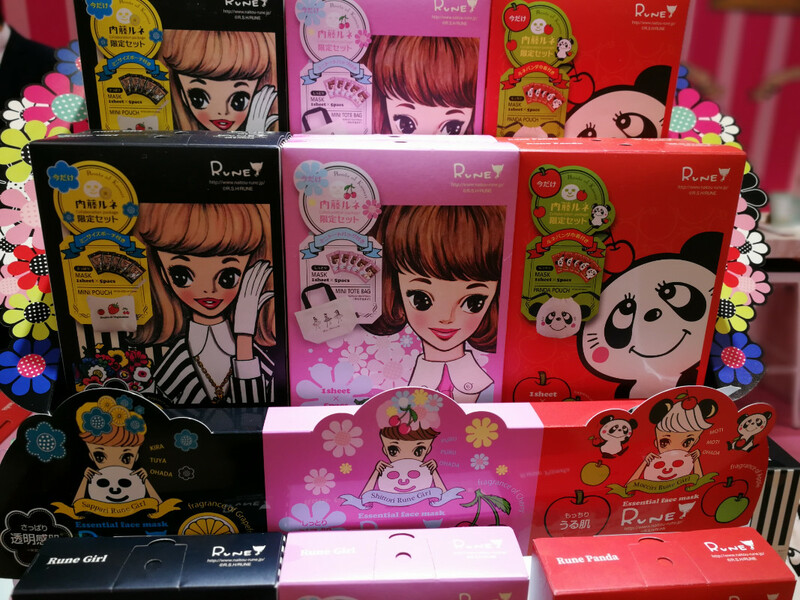 In 2016 A by Bom introduced its first range of consumer sheet masks. 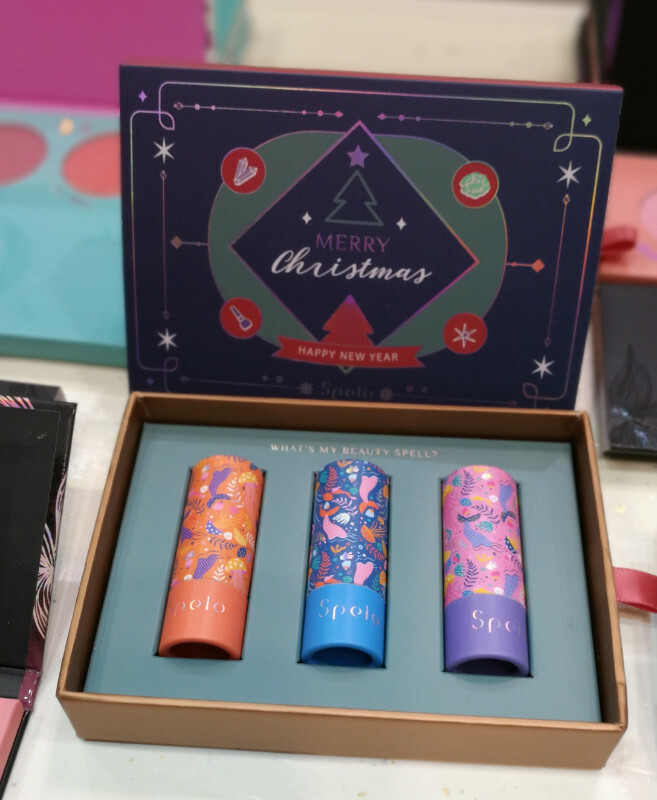 There are six variants altogether and the brand’s products are sold in ten international markets, including Singapore, China, New Zealand, the UK, France and Poland; with Germany (where it will be sold through QVC) and Malaysia to follow soon. 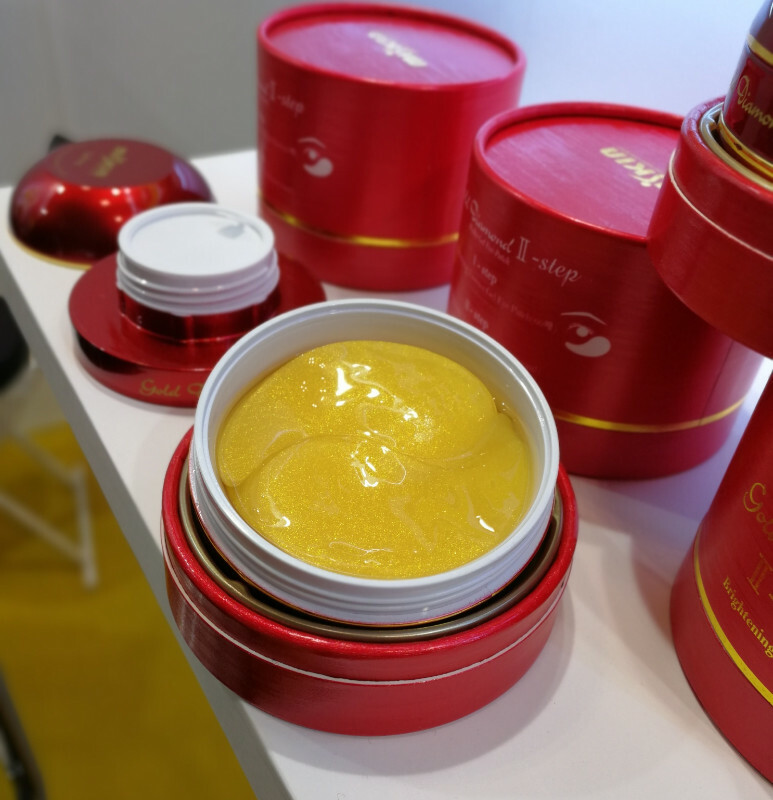 Korean beauty brand Franz‘ star product is the Dual Micro-Current Mask which the company presented at various international trade shows last year. 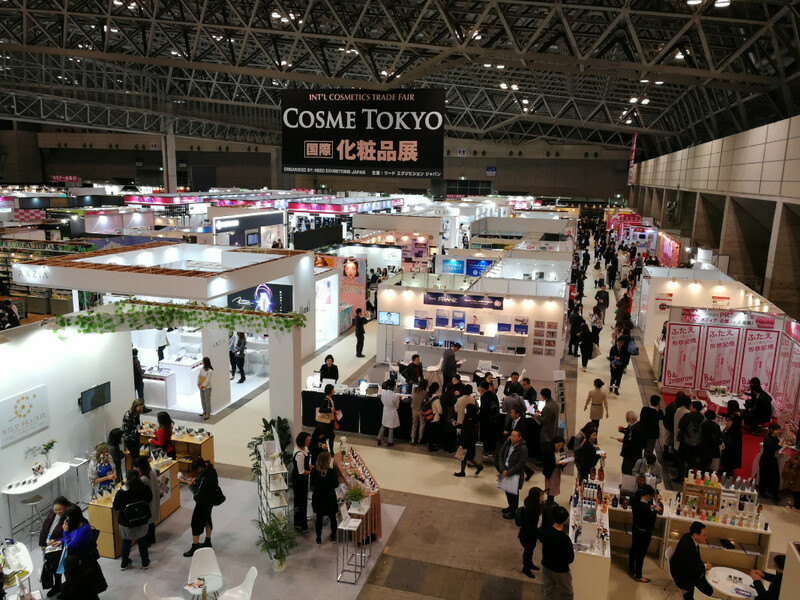 For a more detailed description of how the mask works check out my review of Cosmetokyo 2018. Or check on Youtube, there are loads of Franz masking videos. For 2019, Franz is launching the Dual Micro-Current Mask as a premium edition which is covered in gold foil. 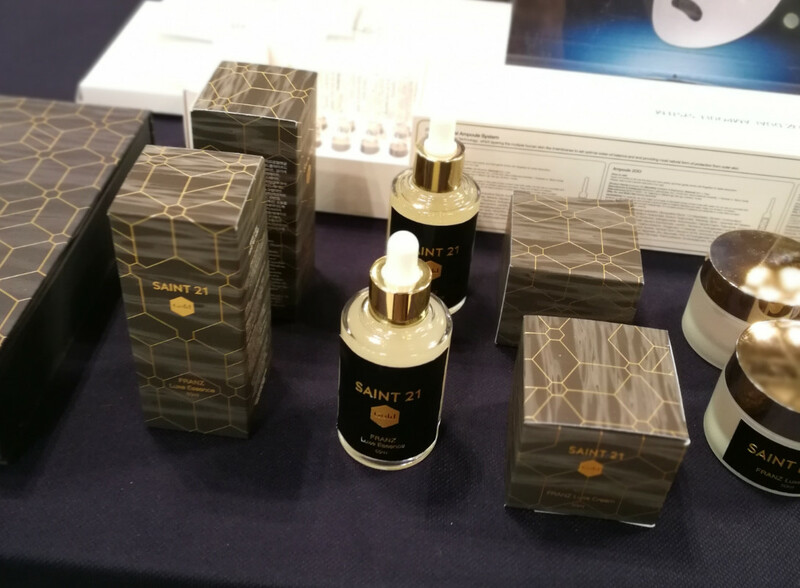 The mask is part of the new Saint 21 range of skin care products which are all formulated with gold extract. 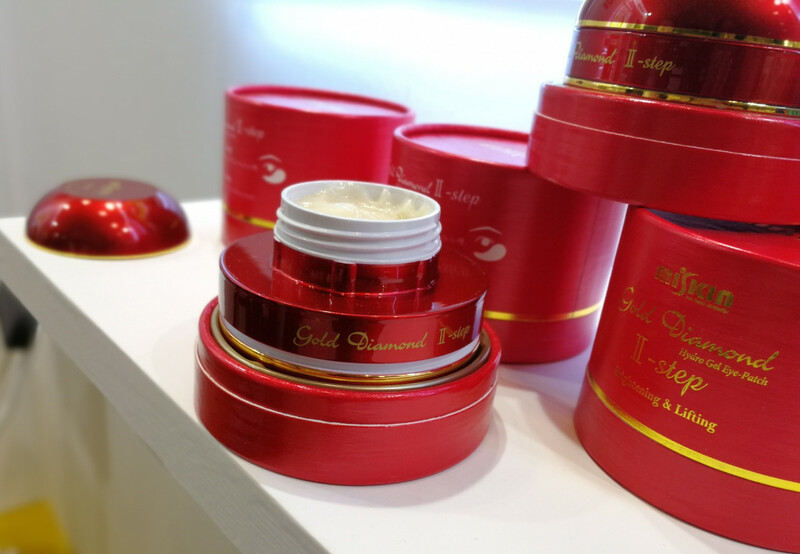 The packaging is very stylish and the kit includes fve sheet masks, 1 bottle of gold essence, 1 jar of gold cream and four stem cell culture medium ampoules. 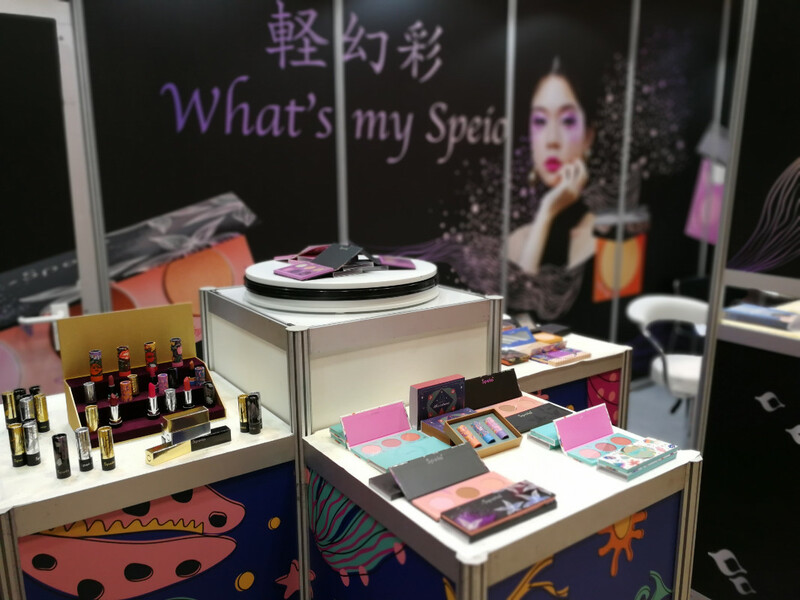 Speio is a young colour cosmetics brand from Taiwan; it was launched in November 2018. 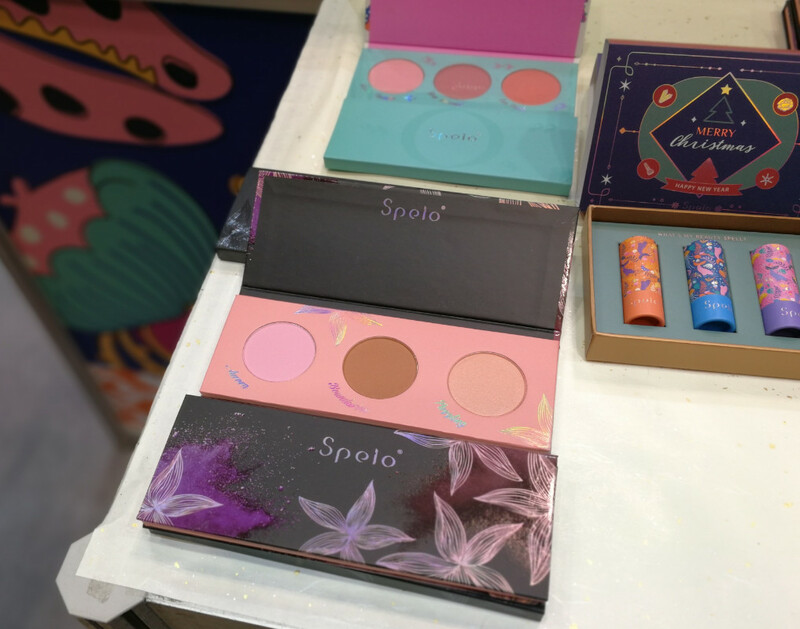 The company behind the product range, Hi-Made, is actually a paper manufacturer which explains why Speio’s packaging is so unusual for an Asian makeup brand: it’s made from cardboard and paper. The line-up offers six palettes – two powder eyeshadows palettes, two powder foundation palettes and two powder blushers/contouring palettes – as well as three lipsticks. 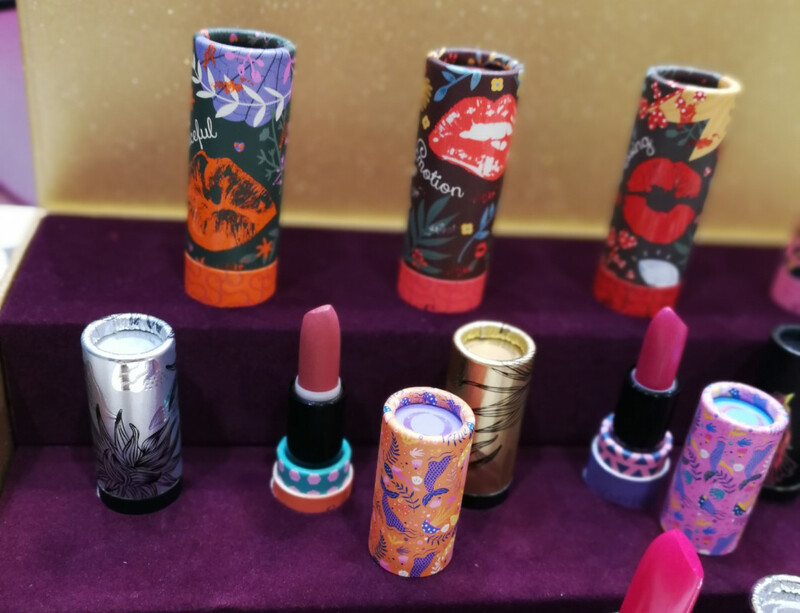 The packaging is beautifully decorated with embossed and printed patterns; the lipstick tubes are also cardboard. Of course the packaging contains some bits of plastic – the hygienic plastic sheet that is placed over the powder colours, for example – but most of the packaging is made from paper fibres. I really like that Speio also offers the lipsticks in a small version – aren’t they cute? And so portable! Naveen is one of my favourite Taiwanese brands and it’s always a pleasure seeing the brand (and its founder Karen) at the various trade shows that we both frequent. 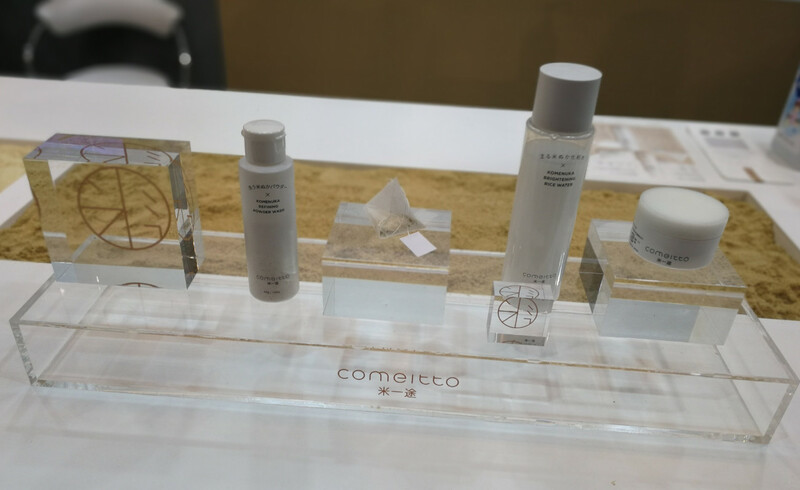 At Cosmetokyo Karen presented a whole range of new launches (which will also be shown at Vivaness organic trade show in Nuremberg next week), including the Microbiome collection of two face care serums which feature an extra portion of fermented and probiotic ingredients. There are two variants; the Stressed Skin Serum and the Uneven & Dull Skin Serum which both contain radish rooot ferment filtrate. The Stressed Skin serum also contains two types of algae extract (chlorella vulgaris and laminaria digitata) and sea water while the Uneven & Dull Skin serum has been formulated with probiotic lactococcus ferment lysate and pomegranate extract. There is also a new sheet mask and a two mineral SPF 50 sunscreens (tinted and neutral). I’ll write more about the Naveen products after Vivaness. Yunnan Baiyao is a TCM (Traditional Chinese Medicine) manufacturer from Yunnan province in South Western China. I read that the Yunnan Baiyao group is one of the top 50 TCM pharmaceutical companies in China. In 1993 the company was listed on the Shenzhen Stock Exchange and today the Yunnan Baiyao group has 18 subsidiaries in China. The company history is fascinating: in 1902 a Chinese TCM medical practicioner from Yunnan, Qu Huanzhang, began developing a herbal ingredients complex (a blend of various TCM herbs) whose Chinese name translated as Qu Huanzhang Panacea. This blend is now known as Yunnan Baiyao – you can google it; it’s a very well-known TCM medicinal complex which said to help heal injuries and wound and can be purchased as different types of supplements. Anyway, the Yunnan Baiyao complex formed the inspiration and jumping-off point for the Yunnan Baiyao group which is one of the key producers of Yunnan Baiyao remedies. In 2006 the group branched out into TCM sheet masks and launched the Orienature range. Which is USDA certified, incidentally. The Orienature masks are all formulated with carefully selected TCM ingredients and there are nine variants in total. Radiant Brightening Mask contains tricholoma matsutake polysaccharide, pearl powder, dendrobium candidum stem extract and yam extract, Revitalizing & Moisturizing Mask has been formulated with opuntia stem extract, jasmine flower water, oat brand extract and tremella fuciformis extract; Whitening & Refreshing Mask includes Chinese White Pear fruit juice, amelopsis japonica root extract, snow lotus extract, oat bran extract and tremella fuciformis extract. The key ingredients in Clear & Hydrating Mask are White Truffle and camellia extracts, oat bran extract, tremella fuciformis and Solomon’s Seal extract and Repair & Moisturizing Mask contains a blend of oat bran extract, camellia flower extract and Chinese sage. Moisturizing & Repair Mask has been formulated with blueberry fruit extract, turmeric extract, tremella fuciformis extract and milk vetch seed extract while Ruddy Skincare & Moisturizing Mask contains Chinese sour cherry extracts, passionflower extract, raspberry fruit extract, saffron extract and pomegranate extract and Firming Anti-Aging Mask includes green algae extract, dendrobium candidum extract, Chinese yam root extract and caviar extract. Finally, Hydrating Anti-Oxidant Mask contains red sage extract, ginseng root extract, figwort root extract and shrubby sophora extract, Regenating & Moisturizing Mask has been formulated with Chinese motherword extract, rhodiola root extract and ganoderma reishi mushroom extract while the ingredients of the 7-Flora Skincare Mask include nardostachys chinensis root extract, Chinese cucumber root extract, green tea extract, dwarf sealily extract, myrrh extract and rose petal extract. The majority of the herbal extracts that I just listed are traditional TCM ingredients. Some are such very specific plant genus/species variants that there is no actual English plant name (or at least none that could be discovered by Googling alone); many herbs only grow in certain parts of China so the English names are, I’d imagine, mostly inaccurate. Just in case any of you readers is a TCM fan who know his/her Chinese herbs! I am finding myself fascinated by Yunnan Baiyao and its TCM products; I really need to find out more about the company and especially about whether their masks are actually organic (i.e. certifiable) or not. 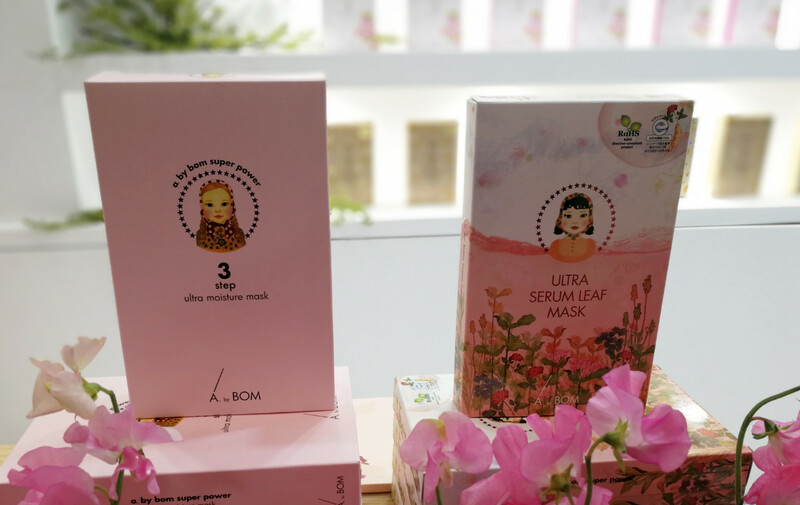 Judging by the Google Translate app which I used on the sheet mask packaging whilst visiting the booth, the INCIs really looked like one plant extract next to the other. However, I’m not certain whether the company has actually listed the entire INCIs on the pack and not just the active (or most spectacular) ingredients. 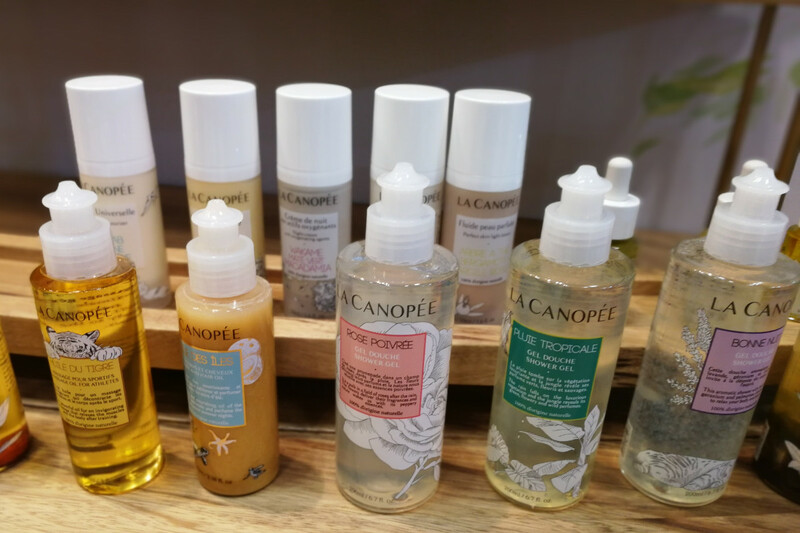 I was very excited to meet organic French niche brand La Canopée at the trade show. I had read about the artisan beauty brand on Beautyjagd blog and was really curious about their products. 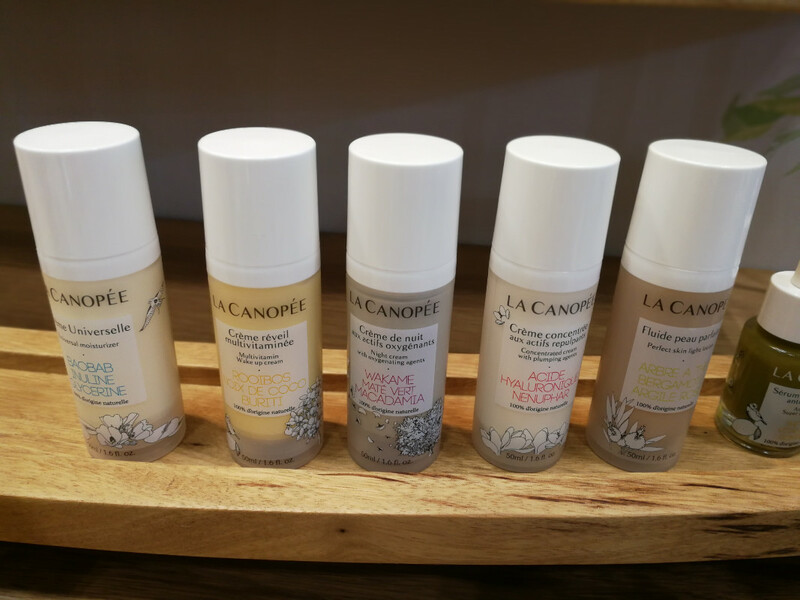 However, La Canopée has a limited distribution outside of France and the brand’s not really available in Germany (yet). Lucky I was at Cosmetokyo, eh? Anyway, the brand was founded in late 2017 by two sisters, Juliette and Cécile.Their brother also works in the company so it’s a real family-owned (or rather, sibling-owned!) business. La Canopée is based in Grasse; all of the products are produced there with as many locally sourced ingredients as possible. The brand’s 27-sku line-up includes 18 face care products; the rest are body oils and shower gels. And here is the face care range: two cleansing oils plus four further cleansing product (a cleansing gel with activated charcoal, a cleansing milk and two cleansing foams); one anti-acne lotion formulated with sage extract, two face mists (the orange blossom toner smells divine! ), three face oil blends, one fruit acid-based face mask and five moisturisers. What I particularly like is that the products are all based on either hydrosols or herbal/tea infusions. The textures are lovely and so are the product fragrances. Some of the face and body care products have flower petals or herbs suspended in the liquid inside the bottles. The brand is available in France (online and offline), in England, Ireland and Belgium. The company is also interested in the Asian markets. And every time that I walked past the brand’s booth it was surrounded by crowds of visitors, so presumable the Asian markets also like La Canopée. 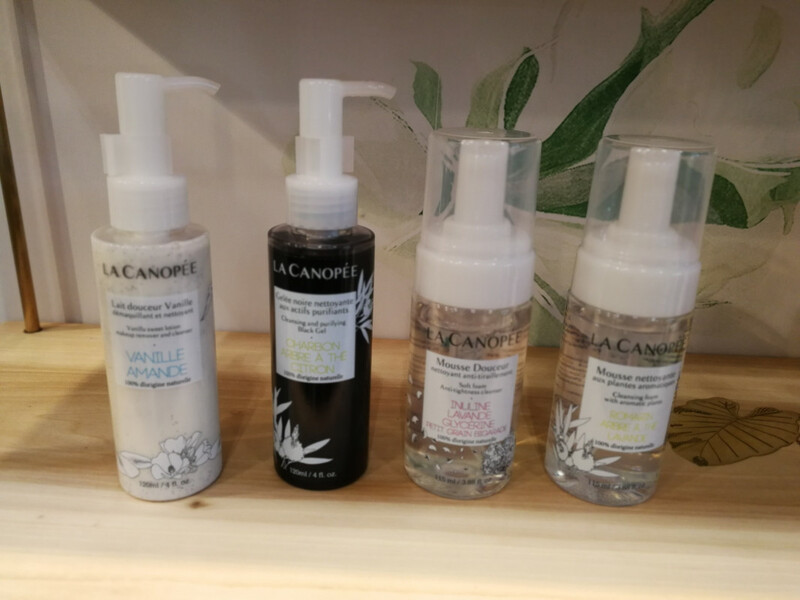 Products are not certified yet but I was told that there will be a certification in a year or so, and then La Canopée will also exhibit at Vivaness trade show. Their next trade event will be Cosmoprof Bologna in March (which I am visiting, too), so hopefully i’ll be able to write more about this charming brand. 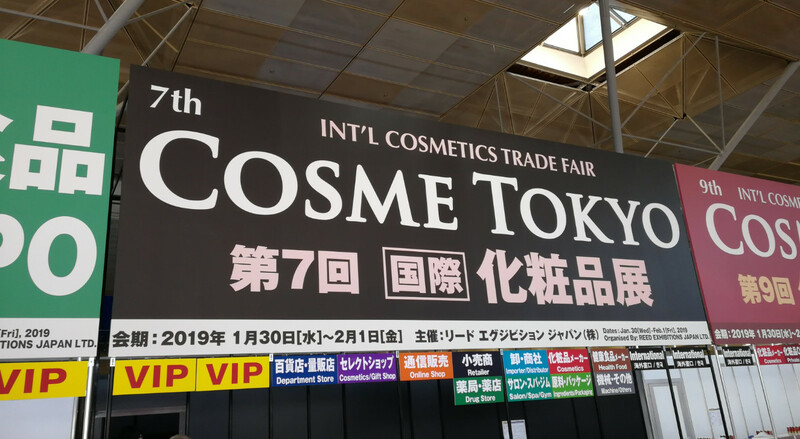 Cosme Tokyo 2010 will take place from 20th-22nd January 2020 and organisers Reed Exhibitions Japan are also launching a new regional version of the trade fair: the first Cosme Osaka trade show takes place from 9th-11th September 2020.